Constitution of Committees to examine the functioning and grant of NOCs to ETT institutes in the State. Government Order No: 564-Edu of 2017 dated: 22/08/2017. Constitution of a Committee of Experts for suggesting measures to bring in systematic changes in assessment of practical work at Secondary and Higher Secondary level. Government Order No: 555-Edu of 2017 dated: 18/08/2017. Compassionate appointment of Mr.Rahul Sharma ,S/O Late Smt. Usha Kumari(Ex-Teacher),R/o Q.No.199,Rehari Colony ,District Jammu,under SRO-43 of 1994. Government Order No: 549-Edu of 2017 dated: 17/08/2017. Acceptance of technical resignation of Mtr. Nusrat Jan, Sr.Lecturer(Arabic),BHSS Tral from the Jammu and Kashmir School Education(Gazetted) Service and termination of lien thereof. Government Order No: 544-Edu of 2017 dated: 16/08/2017. Re-fixation of seniority of +2 Lecturers of School Education Department. dated: 18/08/2017. Transfer and postings of Principals,I/C Principal and equivalent. Government Order No: 552-Edu of 2017 dated: 17/08/2017. Tentative seniority list of PG Masters / Teachers in the discipline of Sociology. dated: 10/08/2017. Placement of Headmasters and equivalent as I/C Zonal Education Officers and equivalent -transfers and postings thereof. Government Order No: 547-Edu of 2017 dated: 16/08/2017. Placement of PG Masters as I/C Lecturers in the discipline of Political Science. Government Order No: 545-Edu of 2017 dated: 16/08/2017. Re-structuring of examination system to increase teaching days: provide opportunity to students to save academic year and introduce transparency. Government Order No: 538-Edu of 2017 dated: 11/08/2017. Placement of PG Masters as I/C Lecturers in the discipline of Mathematics. Government Order No: 532-Edu of 2017 dated: 11/08/2017. Establishing the date of birth of Mr.Rafeeq Ahmad ,Mir,Senior Lecturer,(Physics),BHSS,Handwara. Government Order No: 531-Edu of 2017 dated: 10/08/2017. Appointment of Lecturers(10+2) in the discipline of (Political Science) in the School Education Department. Government Order No: 530-Edu of 2017 dated: 10/08/2017. Transfer /Postings of Lecturers from/to the districts of Leh and Kargil. Government Order No: 529-Edu of 2017 dated: 10/08/2017. Constitution of a Search Committe for suggesting names for the appointment of Chairman,J&K State Board of School Education. Government Order No: 524-Edu of 2017 dated: 09/08/2017. Regularization of Adhoc/contractual/consolidated employees working in the School Education Department. Government Order No: 493-Edu of 2017 dated: 03/08/2017. Suspension of Sh.Pradeep Kumar,I/C Zonal Education Officer,Doongi,Rajouri. Government Order No: 492-Edu of 2017 dated: 02/08/2017. Placement of PG Masters as I/C Lecturer in the discipline of Zoology. Government Order No: 491-Edu of 2017 dated: 01/08/2017. Acceptance of technical resignation of +2 Lecturers (different disciplines) from the Jammu & Kashmir School Education (Gazetted) Service and termination of lien thereof. Government Order No: 490-Edu of 2017 dated: 31/07/2017. CPPIL No.06/2017 in PIL No. 09/2016 titled Badrul Duja V/S State of J&K and Others. Government Order No: 488-Edu of 2017 dated: 31/07/2017. Relaxation in rules for operation of wait list ,adjustment to select list of Teacher,District Cadre Poonch. Government Order No: 486-Edu of 2017 dated: 31/07/2017. Deployment of Mr Rakesh Raina and Mrs Urmilla Pandita,PM's Package Teacher,District Kupwara to Migrant Cell,Jammu. Government Order No: 481-Edu of 2017 dated: 28/07/2017. Corrigendum to Government Order No:478-Edu of 2017 Dated:-27.07.2017. Appointment of Lecturer 10+2 in the discipline of Education in the school Education Department. Government Order No: 474-Edu of 2017 dated: 25/07/2017. Acceptance of technical resignation of +2 Lecturers (different disciplines) from the Jammu and Kashmir School Education (Gazetted) Service and termination of lien thereof. Government Order No: 473-Edu of 2017 dated: 25/07/2017. Final seniority list of PG Masters/ Teachers in the discipline of Political Science. Government Order No: 469-Edu of 2017 dated: 24/07/2017. Compassionate appointment of Mr Vishal Sharma S/O Late Mast Ram (Ex-Teacher) R/o Village Hathal,Tehsil Sunderbani, District Rajouri,under SRO-43 of 1994. Government Order No: 468-Edu of 2017 dated: 24/07/2017. Compassionate appointment of Mr Rajesh Kumar Banotra and Late Smt.Santosh Sharma (Ex-Master) R/o Ward No. 1 college Road , District Kathua ,under SRO-43 of 1994. Government Order No: 467-Edu of 2017 dated: 24/07/2017. Final seniority list of PG Masters / Teachers in the discipline of Mathematics. Government Order No: 463-Edu of 2017 dated:21/07/2017. Inter-district transfer of Ms. Anupama Thakur,Teacher,GPS,Dollian Jattan, Zone Marheen,District kathua to District Jammu on marriage grounds. Government Order No: 456-Edu of 2017 dated: 19/07/2017. Inter-district transfer of Mrs. Puja Mahajan,Teacher,Govt. Higher Secondary School ,Batote, District Ramban to District Udhampur on Marriage grounds. Government Order No: 454-Edu of 2017 dated: 19/07/2017. Repatraition of Sh.Majid Ahmad Kohli,I/C Director , Jan Shiksha Sansthan (JSS),Jammu to the School Education Department,Jammu. Government Order No: 453-Edu of 2017 dated: 19/07/2017. Grant of extra-ordinary leave in favour of Mr. Mohammad Sajid Kirmani,Teacher,GMS Pandrathan. Government Order No: 451-Edu of 2017 dated: 19/07/2017. Inter-district transfer of Mrs. Sumhira Yasmeen,Teacher,Govt. High School ,Jodhpur, District Doda to District Kishtwar on marriage grounds. Government Order No: 444-Edu of 2017 dated: 17/07/2017. Grant of Extraordinary leave (EOL) without pay in favour of Ms.Monisa Nisar,Lecturer(Geography). Government Order No: 441-Edu of 2017 dated: 17/07/2017. Posting/adjustment of Mr.Shabir Ahmad,I/C Lecturer (Urdu). Government Order No: 440-Edu of 2017 dated: 17/07/2017. Deployement of Ms. Wajida Tabasum, RRET,Teacher,Naralla,Bhera Mendhar District Poonch to District Jammu. Government Order No: 434-Edu of 2017 dated: 17/07/2017. Deputation of Dr.Anuradha Sharma,Lecturer, DIET Jammu and Mr.Sayed Qamar-ud-Din,Lecturer, DIET Budgam (Beerwah),as Academic Officers,in J&K Board of School Eduction(BOSE). Government Order No: 431-Edu of 2017 dated: 17/07/2017. Extension in inter-district transfer of Sh. Abdul Malik , Teacher, Government High School, Soomber District Ramban to District Poonch on medical graounds. Government Order No: 430-Edu of 2017 dated: 14/07/2017. Transfer and postings of Zonal Educational Officers /I/C ZEOs and equivalent. Government Order No: 424-Edu of 2017 dated: 14/07/2017. Tentative seniority list of PG Masters / teachers in the discipline of Stenography. Government Notice dated: 14/07/2017. Transfer and posting of Principals/In-charge Principals of +2 Schools and equivalent. Government Order No: 422-Edu of 2017 dated: 12/07/2017. Transfer of Ms Rajbir Kour ,Lecturer(EVS) Government Order No: 421-Edu of 2017 dated: 11/07/2017. Written test & short listing of candidates for engagement of subject specific PG teachers on contractual basis - Constitution of Committee. Government Order No: 418-Edu of 2017 dated: 11/07/2017. Transfer/posting of Mr.Bashir Ahmad Malik ,Lecturer (Political Science). Government Order No: 417-Edu of 2017 dated: 10/07/2017. Acceptance of technical resignation of +2 Lecturers from the Jammu & Kashmir School Education (Gazetted) Service and termination of lien thereof. Government Order No: 416-Edu of 2017 dated: 10/07/2017. Voluntary retirement of Mtr.Muneera Fatima,I/C HOD,DIET,Srinagar. Government Order No: 415-Edu of 2017 dated: 10/07/2017. Recognition of Private Schools. Government Order No: 414-Edu of 2017 dated: 10/07/2017. Deputation of Sh. Charandeep Singh,KAS Joint Director,School education Department, for training programme from July 10-14,2017 at Munnar,Kerala. Government Order No: 409-Edu of 2017 dated: 07/07/2017. Transfer and postings of Principals/ I/C Principals. Government Order No: 408-Edu of 2017 dated: 07/07/2017. Placement of PG Masters as I/C Lecturers in the discipline of Bio-Chemistry. Government Order No: 406-Edu of 2017 dated: 07/07/2017. Withdrawal of placement of PG Masters as I/C Lecturers in the Discipline of Chemistry. Government Order No: 405-Edu of 2017 dated: 07/07/2017. Fixation of seniority of Mtr.Gowhar-un-Nisa, Master, GHS Ichigam Budgam and Mr.Ab.Rehman Bhat,Master, Hs Nowpora in the updated seniority list of PG Masters/Teachers in the discipline of Bio-Chemistry. Government Order No: 403-Edu of 2017 dated: 07/07/2017. Transfer and postings of I/C CEO and equivalent. Government Order No: 402-Edu of 2017 dated: 07/07/2017. Compassionate appointment of Smt.rehmat Begum, W/O Late Mohd Afsal Traqwal,(Ex-Peon) R/O Gool,Tehsil and District Ramban,under SRO-43 of 1994. Government Order No: 401-Edu of 2017 dated: 07/07/2017. Compassionate appointment of Smt. Rewa Devi,W/o Late Puran Singh,(Ex-Teacher) R/O Billawer ,District Kathua under SRO-43 of 1994. Government Order No: 400-Edu of 2017 dated: 07/07/2017. Corrigendum to Government Order No: 271-Edu of 2017 dated: 07/07/2017. Corrigendum to Government Order No: 366-Edu of 2017 dated: 29/06/2017. Relaxation in rules for operation of wait list,adjunct to select list of teachers in Distict cadre Doda. Government Order No: 399-Edu of 2017 dated: 07/07/2017. Compassionate appointment of Ms. Radhika Sharma, D/O Ravinder kumar sharma, and Late Smt. Nirmal sharma ,(Ex-Teacher) R/O Village Gurha Mehtian,Tehsil Hiranagar,District Kathua ,under SRO-43 of 1994. Government Order No: 398-Edu of 2017 dated: 07/07/2017. Transfer and postings of Zonal Education Officers /I/C ZEOs and equivalent. Government Order No: 395-Edu of 2017 dated: 06/07/2017. SWP No. 1928/2016,MP No. 01/2016 titled Ghulam Rubani deeded V/s State of J&K & others. Government Order No: 394-Edu of 2017 dated: 06/07/2017. Regularization of I/C Lecturers as Lecturers in the discipline of Mathematics Government Order No: 391-Edu of 2017 dated: 05/07/2017. Regularization of I/C Lecturers as Lecturers in the discipline of English. Government Order No: 390-Edu of 2017 dated: 05/07/2017. Fixation / Re-fixation of seniority of +2 Lecturers in the updated seniority list of Lecturers and placement as Senior Lecturers thereof. Government Order No: 388-Edu of 2017 dated: 05/07/2017. Regularization of I/C Lecturers as Lecturers in the discipline of Botony. Government Order No: 387-Edu of 2017 dated: 05/07/2017. 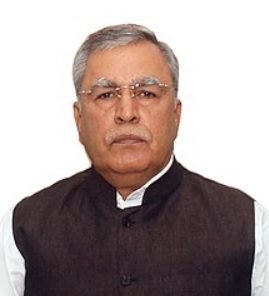 Appointment of Mr. Mehboob Hussain Dar, Principal, SIE, Kashmir, as Inquiry Offficer. Government Order No: 385-Edu of 2017 dated: 04/07/2017. Compassinate appointment of Mr.Sandeep Kumar,H/o Late Smt.Sunita Kumari. (Ex-Teacher), R/o Begana, (Matta) tehsil & District Kishtwar,under SRO-43 of 1994. Government Order No: 383-Edu of 2017 dated: 04/07/2017. Appointment of Lecturer 10+2 in the discipline of Mathematics in School Education Department. Government Order No: 384-Edu of 2017 dated: 04/07/2017. Treating of suspension period as on duty in favour of Mr.Mohd Sayeed, Senior Lecturer. Government Order No: 380-Edu of 2017 dated: 04/07/2017. Acceptance of technical resignation of +2 Lecturers (different disciplines) from the Jammu & kashmir School Education(Gazetted) Service and termination of lien thereof. Government Order No: 376-Edu of 2017 dated: 03/07/2017. Updated seniority list of PG Masters /Teachers in the discipline of Islamic Studies. Government Order No: 373-Edu of 2017 dated: 30/06/2017. Addendum to Government Order No: 372-Edu of 2017 dated: 29/06/2017. Cancellation of Transfers and Postings of Zonal Educational Officers /I/C ZEOs and equivalent. Government Order No: 372-Edu of 2017 dated: 29/06/2017. Transfers and Postings of Zonal Educational Officers /I/C ZEOs and equivalent. Government Order No: 366-Edu of 2017 dated: 29/06/2017. Transfers and postings of I/C Chief Education Officers and equivalent. Government Order No: 371-Edu of 2017 dated: 29/06/2017. SWP No. 1791/2016 titled Mohd. Iqbal Bhat & ors V/s State of J&K & ors C/W ors. Government Order No: 368-Edu of 2017 dated: 29/06/2017. Announcement of summer vacations in the Schools falling in the kashmir Division and Winter Zone of Jammu Division. Government Order No: 365-Edu of 2017 dated: 29/06/2017. Inter-district transfer of Smt. Anchal Verma Teacher Govt. High School Chirayi,Tikri district Udhampur to District Jammu on marrriage grounds. Government Order No: 364-Edu of 2017 dated: 29/06/2017. Instruction regarding visiting of Governement officers/officials of School Education Department to the Administrative Department,Civil Scretarait. Circular No. 02-Edu of 2017 dated: 20/06/2017. Introduction of regional languages (Kashmiri,Dogri & Bodhi) at Secondary Level in government and Private(recognized) Schools of the State. Government Order No: 333-Edu of 2017 dated: 22/06/2017. Transfers and Postings of Principals/In-charge Principals of +2 Schools and equivalent. Government Order No: 354-Edu of 2017 dated: 22/06/2017. Contempt No.89/2016 in SWP No.2118/2014 titled Syed Gulzar Ahmad V/s State and Others. Government Order No: 339-Edu of 2017 dated: 20/06/2017. Transfer and Postings of CEOs/ I/C CEOs and equivalent. Government Order No: 337-Edu of 2017 dated: 19-06-2017. Fixation of seniority of Mtr.Shamima Akhter, Master ,Girls HS,Pompore in the updated seniority list of PG Masters/Teachers in the discipline of Urdu. Government Order No: 327-Edu of 2017 dated: 19/06/2017. Repatriation of Mrs. Vijay Lakshmi,Incharge Chief Education Officer from JKBOSE. Government Order No: 326-Edu of 2017 dated: 16-06-2017. Placement of PG Master as I/C Lecturer in the discipline of Sanskrit. Government Order No: 323-Edu of 2017 dated: 16-06-2017. Extention in the inter-district transfer of Ms.Saima Bashir, Teacher,Govt. Middle School, Drangabal,Pampore , district Pulwama to district Srinagar on security grounds. Government Order No: 315-Edu of 2017 dated: 15-06-2017. Placement of PG Masters as I/C Lecturer in the discipline of Zoology. Government Order No: 317-Edu of 2017 dated: 15-06-2017. Regularization of Adhoc/Contractual /Consolidated Employees working in the School Education Department. Government Order No: 316-Edu of 2017 dated: 15-06-2017. 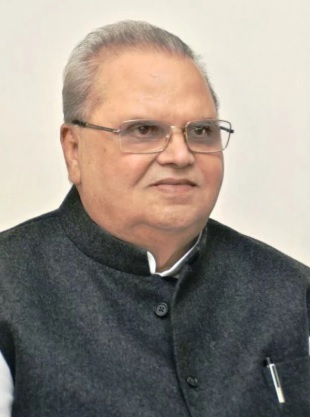 Re-instatement of shri Babu Ram,the then Principal,HSS R.S. Pura,Jammu. Government Order No: 315-Edu of 2017 dated: 15-06-2017. Int'l Conference on Inclusive and Quality Education: Towards Sustainable Development Goal's,17-18th June, 2017, at New Delhi -deputation of officers thereof. Government Order No: 314-Edu of 2017 dated: 15-06-2017. Transfers and Postings of I/C Chief Education Officers and equivalent. Government Order No: 310-Edu of 2017 dated: 14-06-2017. Inter-district transfer of Smt Harmeet kour,Teacher UPS Dharmound Zone Batote from District Ramban to District Jammu on Marriage grounds. Government Order No: 307-Edu of 2017 dated: 14-06-2017. Contempt SWP No.373 of 2013 in SWP No.2426/12 titled Sanjay Kumar V/S State. Government Order No: 306-Edu of 2017 dated: 14-06-2017. Compassionate appointment of Ms.Asimita Khajuria,D/O Late Smt.Anju Sharama(Ex-Master),R/O G-210,Sainik Colony,Jammu under SRO-43 of 1994. Government Order No: 304-Edu of 2017 dated: 13-06-2017. Treatment of suspension period of Shri Mohammad Yousaf Lone,the then Principal HSS,Sogam(Now retired). Government Order No: 299-Edu of 2017 dated: 13-06-2017. Inter-district transfer of Smt Sakshi Bajaj , Teacher GHS Birpur District Samba to District Jammu. Government Order No: 298-Edu of 2017 dated: 13-06-2017. Acceptance of technical resignation of Saba Rauf Rafiqi,Lecturer (English) from the Jammu & Kashmir School Education (Gazetted) Service and termination of lien thereof. Government Order No: 297-Edu of 2017 dated: 12-06-2017. State working Committee on National Foundation for Teacher's Welfare(NFTW). Government Order No: 296-Edu of 2017 dated: 12-06-2017. Appointment of Lecturer 10+2 in the discipline of Zoology in School Education Department. Government Order No: 295-Edu of 2017 dated: 09-06-2017. Appointment of Lecturer 10+2 in the discipline of Physics in School Education Department. Government Order No: 294-Edu of 2017 dated: 09-06-2017. Transfer of Sh.Shashi Kant,Lecturer(Bio-Technology) from BHSS Zadibal (Kashmir Province) to HSS Mughal Maidan,District Kishtwar(Jammu Province). Government Order No: 293-Edu of 2017 dated: 09-06-2017. Acceptance of Technical resignation of +2 Lecturers (different disciplines) from the jammu & kashmir School Education(Gazetted) Service and termination of lien thereof. Government Order No: 292-Edu of 2017 dated: 09-06-2017.
Review of Policy of 'No Detention' up to elementary level, conduct of assessment and evaluation and improved implementation of Continous Comprehensive Evaluation(CCE). Government Order No: 287-Edu of 2017 dated: 08-06-2017. Appointment of Inquiry Officer to enquire the charges framed against Mr.Shah Nawaz Khan, I/C Zonal Education Officer,Manjakote. Government Order No: 286-Edu of 2017 dated: 08-06-2017. Appointment of Mr. Abid Husssain, KAS, Jt.Dir. (South),Directorate of School Education, Kashmir, as Inquiry Officer. Government Order No: 285-Edu of 2017 dated: 08-06-2017. Inter-district Transfer of Mtr.Chassfida Akhtar,Lab Assistant,GHSS Shangus, from District Anantnag to District Baramulla on marriage grounds. Government Order No: 281-Edu of 2017 dated: 08-06-2017. Appointment of Lecturer 10+2 in the discipline of Chemistry in School Education Department. Government Order No: 280-Edu of 2017 dated: 07-06-2017. Appointment of Lecturer 10+2 in the discipline of commerce in School Education Department. Government Order No: 278-Edu of 2017 dated: 07-06-2017. SWP No.2577/16 titled Sahil Karnal V/S State & Ors. Government Order No: 273-Edu of 2017 dated: 06-06-2017. Transfer and Postings of I/C Principal and equivalent. Government Order No: 272-Edu of 2017 dated: 06-06-2017. Corrigendum to Government Order No: 271-Edu of 2017 dated: 07-06-2017. Transfer and Posting of I/C Chief Education Officers and equivalent. Government Order No: 271-Edu of 2017 dated: 06-06-2017. Appointment of Lecturer 10+2 in the discipline of Statistics in School Education Department. Government Order No: 269-Edu of 2017 dated: 06-06-2017. Transfer of Mtr.Romana Nazli,Lecturer (Urdu),GHSS Nawakadal,Srinagar(Kashmir Province) to District Doda (Jammu Province). Government Order No: 268-Edu of 2017 dated: 06-06-2017. Repatriation of Lecturers from frontier Districts of Leh and Kargil. Government Order No: 265-Edu of 2017 dated: 01-06-2017. Regularization of Adhoc/Contractual/Consolidated Employees working in the School Education Department. Government Order No: 258-Edu of 2017 dated: 31-05-2017. Compassionate appointment case of Mr.Sofi Hashim-ur-Rashid,S/O Late Sofi Abdur Rashid (Ex-Lecturer),R/O Saloora, Tehsil and District Ganderbal, under SRO-43 of 1994. Government Order No: 248-Edu of 2017 dated: 26-05-2017. Re-constitution of Village Education Committees(VECs). Government Order No: 247-Edu of 2017 dated: 26-05-2017. Deputation of Smt. Tsetan Dolkar, I/C Joint Director, Direcorate of School Education,Jammu as I/c Joint Director, Sakshar Bharat Mission(SBM). Government Order No: 246-Edu of 2017 dated: 26-05-2017. Deputation of Mr.Arif Ahmad Akhoon,Associate Professor and I/C Principal,Government Degree College,Utersoo Anantnag, as Joint Secretary ,J&K Board of School Education(BOSE). Government Order No: 245-Edu of 2017 dated: 26-05-2017. Holding of Screening Test of RETs. Cancellation of transfer of Lecturers from District kargil. Government Order No: 243-Edu of 2017 dated: 26-05-2017. Retention of Mr.Irshad Ahmad Malik,Lecturer(Physics). Government Order No: 242-Edu of 2017 dated: 26-05-2017. Repatriation of Lecturers from District Kargil. Government Order No: 241-Edu of 2017 dated: 26-05-2017. Cancellation of transfer of Lecturer from Leh and Kargil Districts. Government Order No: 239-Edu of 2017 dated: 26-05-2017. Regularization of Adhoc/Contractual/Consolidated Employees working in the School Education Department. Government Order No: 235-Edu of 2017 dated: 23-05-2017. Transfers and Postings of Principals/Incharge Principals of +2 Schools and equivalent. Government Order No: 234-Edu of 2017 dated: 22-05-2017. Release of funds in favour of Principal Sainik School Nagrota for the year 2017-18. Government Order No: 229-Edu of 2017 dated: 18-05-2017. Release of funds in favour of Principal Sainik School Manasbal for the year 2017-18. Government Order No: 228-Edu of 2017 dated: 18-05-2017. Revocation of suspension of Shri Prem Nath,I/C Principal,Balmatkote,treating the period of unauthorized absence thereof. Government Order No: 227-Edu of 2017 dated: 17-05-2017. Post facto sanction of Medical treatment outside the State in favour of Mtr.Hajra Begum,Peon,BMS Kupwara. Government Order No: 226-Edu of 2017 dated: 17-05-2017. Transfers and Postings of Principals/Incharge Principals of +2 Schools and equivalent. Government Order No: 225-Edu of 2017 dated: 16-05-2017. Transfers and postings of Principals / I/C Principals & equivalent. Government Order No: 218-Edu of 2017 dated: 12-05-2017. Placement of Senior Lecturers and I/C ZEOs ≡alent as I/C Principal & equivalent. Government Order No: 207-Edu of 2017 dated: 27-04-2017. Inter-district transfer of Mtr. Tasmeena Akhter ,Teacher ,BHS Chewa,from District Bandipora to District Ganderbal on marriage grounds. Government Order No: 204-Edu of 2017 dated: 27-04-2017. Inter-district transfer of Smt. Sunaina ,Teacher ,GMS Handwara ,from District Kupwara to District Budgam. Government Order No: 203-Edu of 2017 dated: 27-04-2017. Inter-district transfer of Smt.Asha Rani ,Teacher ,GMS Rerem,Zone Kunzar,from District Baramulla to District Samba, on marriage grounds. Government Order No: 202-Edu of 2017 dated: 27-04-2017. Inter-district transfer of Mtr. Sameena Yousuf,Teacher ,GMS Braripora,Handwara, from District kupwara to District Budgam on marriage grounds. Government Order No: 201-Edu of 2017 dated: 27-04-2017. Inter-district transfer of Mtr. Maryam Akhter, Teacher, Boys Middle School Kupwara,from District kupwara to District Ganderbal on marriage grounds. Government Order No: 200-Edu of 2017 dated: 27-04-2017. Inter-district transfer of Mtr.Reena Devi, Teacher, HS Khanater Zone Kanuyian,District Poonch to District Jammu on Humanitarian grounds. Government Order No: 199-Edu of 2017 dated: 27-04-2017. Inter-district transfer of Mtr.Maryam Jameela, Teacher, HS Lakipora, from District Kupwara to District Baramulla on marriage grounds. Government Order No: 198-Edu of 2017 dated: 27-04-2017. Inter-district transfer on mutual/reciprocal basis of Smt. Arti Devi,Teacher,Govt. Middle School,Sarkoot Zone District kishtwar and Smt. Parul,Teacher,City Middle School,Doda.. Government Order No: 197-Edu of 2017 dated: 27-04-2017. Inter-district transfer on mutual/reciprocal basis of Smt.Lakshmi Devi,Teacher,Govt. Higher Secondary School, Nud, District Samba and Sh.Makhan Lal,Teacher ,Gown Udhampur. Government Order No: 196-Edu of 2017 dated: 27-04-2017. Inter-district transfer of Smt. Harmeek Kour, Teacher ,GMS Rajpura Zone mandi District Jammu on marriage grounds. Government Order No: 195-Edu of 2017 dated: 27-04-2017. Inter-district transfer of Mtr.Mymoona Akhter,Teacher,GHS Chogal, Handwara,from District Kupwara to District Budgam, on marriage grounds. Government Order No: 194-Edu of 2017 dated: 27-04-2017. Inter-district transfer of Mtr.Jameela Bano, Teacher,GMS Bagh Bandipora,from District Bandipora to District Ganderbal. Government Order No: 193-Edu of 2017 dated: 27-04-2017. Inter-district transfer of Mtr.Shagufta Nazneen Teacher,Govt. Middle School,zone Gool,District Ramban to district Jammu on medical grounds. Government Order No: 192-Edu of 2017 dated: 27-04-2017. Inter-district transfer of Smt.Shivali Gupta,Teacher,GMS East Mand,Tikri,from District Udhampur to District Jammu on marriage grounds. Government Order No: 191-Edu of 2017 dated: 27-04-2017. Inter-district transfer of Mr.Rohit Koul,Teacher,BMS Zangam,Zone Pattan,from District Baramulla to District Budgam on medical grounds. Government Order No: 190-Edu of 2017 dated: 27-04-2017. Transfer of Sh. Sarfraz Ahmad, Lecturer (Urdu) Government Higher Secondary School Dehri Ralyote, Rajouri to Government Higher Secondary School Dhargloon,District Poonch. Government Order No: 189-Edu of 2017 dated: 27-04-2017. Enhancement of Fee without approval of Fee Fixation Committee(FFC);Public Notice thereof Dated: 21-04-2017. Complaint regarding School uniforms;Public Notice thereof Dated: 21-04-2017. Recognition of Private Schools. Government Order No: 184-Edu of 2017 dated: 21-04-2017. Appointment of Lecturer 10+2 in the discipline of English in School Education Department. Government Order No: 183-Edu of 2017 dated: 21-04-2017. Appointment of Lecturer 10+2 in the discipline of Urdu in School Education Department. Government Order No: 182-Edu of 2017 dated: 21-04-2017. Grant of NOC in favour of ETT Institutes. Government Order No: 181-Edu of 2017 dated: 21-04-2017. Complaint against Shri Arun kumar Gupta,I/C Head Master G.H.S Gurdhan Bala(Rajouri)- enquiry thereof. Government Order No: 179-Edu of 2017 dated: 19-04-2017. Post facto sanction of Medical treatment outside the state in favour of Smt.Anita Raina Teacher,Zone Qazigund. Government Order No: 178-Edu of 2017 dated: 19-04-2017. Updated seniority list of PG Masters/ Teachers in the discipline of English. Government Order No: 177-Edu of 2017 dated: 18-04-2017. Condemnation of Departmental Vehicles. Government Order No: 176-Edu of 2017 dated: 17-04-2017. COA(SWP) No. 122/2017 in SWP No:906/2016 titled Mohd.Aslam V/S State and Others. Government Order No: 175-Edu of 2017 dated: 17-04-2017. Re-instatement of Shri Mohammad Yousuf Lone,Principal. Government Order No: 174-Edu of 2017 dated: 17-04-2017. SWP No:2841/2016 MP No. 01/2016 titled Lal Chand V/S State and others. Government Order No: 173-Edu of 2017 dated: 12-04-2017. Release of funds as 'Grant-in-Aid' under SSA for the financial year 2017-18. Government Order No: 172-Edu of 2017 dated: 10-04-2017. SWP NO.2557/2016 titled Vinod Kumar V/s state & Ors. Government Order No: 171-Edu of 2017 dated: 31-03-2017. Re-appropriation of funds under CapexBudget 2016-17. Government Order No: 170-Edu of 2017 dated: 31-03-2017. Appointment of Mr.Abid Hussain,KAS,Jt.Dir. (South),Directorate of School Education,Kashmir. Government Order No: 169-Edu of 2017 dated: 31-03-2017. Placement of PG Master/ Teacher as I/C Lecturer in the discipline of Computer Science. Government Order No: 168-Edu of 2017 dated: 31-03-2017. Re-appropriation of funds under Capex Budget 2016-17. Government Order No: 167-Edu of 2017 dated: 30-03-2017. Re-appropriation of funds under CapexBudget 2016-17. Government Order No: 166-Edu of 2017 dated: 30-03-2017. Release of additional funds under Capex Budget 2016-17. Government Order No: 165-Edu of 2017 dated: 30-03-2017. Release of funds under Mid Day Meal Scheme for the year 2016-17. Government Order No: 164-Edu of 2017 dated: 30-03-2017. Parking of funds in the Civil deposits released under Capex Budget 2016-17. Government Order No: 163-Edu of 2017 dated: 30-03-2017. Re-fixation of seniority of +2 Lecturers of School Education Department. Abridged Notice dated: 29-03-2017. Release of additional funds under Capex Bufget 2016-17. Government Order No: 162-Edu of 2017 dated: 29-03-2017. Release of funds under Mid Day Meal Scheme 2016-17(Center Share). Government Order No: 161-Edu of 2017 dated: 29-03-2017. Appointment of Inquiry Officer to enquire into the charges framed against Mr.Shah Nawaz Khan,I/C Zonal Education Officer,Manjakote. Government Order No: 160-Edu of 2017 dated: 29-03-2017. Release of additional funds under Capex Budget 2016-17. Government Order No: 159-Edu of 2017 dated: 27-03-2017. Regularization of Adhoc/Contractual/Consolidated Employees working in the School Education Department. Government Order No: 158-Edu of 2017 dated: 27-03-2017. Acceptance of technical resignation of Mtr.Zahida Akhter(Arabic) from the Jammu & Kashmir School Education(Gazetted) Service and termination of lien thereof. Government Order No: 157-Edu of 2017 dated: 27-03-2017. Inter-district transfer of Smt Rekha Devi,Junior Assistant,Govt.High School Nomian,from District Jammu on marriage grounds. Government Order No: 156-Edu of 2017 dated: 27-03-2017. Inter-district transfer of Smt Arti Sharma,Lab Assistant,HSS Shieldara,Poonch to District Rajouri on on marriage grounds. Government Order No: 155-Edu of 2017 dated: 27-03-2017. Inter-district transfer of Smt Kheema Verma,Teacher Govt Primary School,Kalsar Zone Tikri,District Udhampur from District Samba on medical grounds. Government Order No: 154-Edu of 2017 dated: 27-03-2017. Inter-district transfer of Smt Fehmeda Akhter,Teacher Govt Midddle School,Charee,,Zone Banihal from District Ramban to District Doda on Marriage grounds. Government Order No: 153-Edu of 2017 dated: 27-03-2017. Inter-district transfer of Sri Rakesh kumar,Class-IV,GHS Kootah, District Kathua and Romesh Chander,Class-IV GHS Ghagwal,District Samba on reciprocal basis. Government Order No: 152-Edu of 2017 dated: 27-03-2017. Inter-district transfer Smt Gurvinder kour,Teacher Govt Higher Secondary School Dhangri from Disrtict Rajouri to District Samba on Marriage grounds. Government Order No: 151-Edu of 2017 dated: 27-03-2017. Inter-district transfer Smt Ritu Sharma,Teacher Govt Primary School,Kothri Zone Batote District Ramban to District Udhampur on Marriage grounds. Government Order No: 150-Edu of 2017 dated: 27-03-2017. Revalidation of funds under CSS Rashtriya Madhyamik Shiksha Abhiyan(RMSA) for its utilization during the year 2016-17. Government Order No: 149-Edu of 2017 dated: 27-03-2017. Inter-district transfer Shri Kewal Krishan, Govt High School ,Majua Zone Bishnah District Jammu and Smt.Rajni devi,Teacher,Govt Middle School,Pathwal, Zone Sallan District Kathua on reciprocal basis. Government Order No: 148-Edu of 2017 dated: 27-03-2017. Sanction for advance drawal of Rs 3.50 lac. Government Order No: 147-Edu of 2017 dated: 27-03-2017. Release of funds in favour of Principal Sainik School Manasbal for the year 2016-17. Government Order No: 146-Edu of 2017 dated: 27-03-2017. Suspension of Sh. Sajad Mir, Master BHSS Darhal Government Order No: 145-Edu of 2017 dated: 24-03-2017. Sanction for Advance Drawal for an amount of Rs.7.50 lac. Government Order No: 144-Edu of 2017 dated: 24-03-2017. Sanction for Advance Drawal for an amount of Rs.7.50 lac. Government Order No: 143-Edu of 2017 dated: 23-03-2017. Sanction for Advance Drawal for an amount of Rs.23.76 lac. Government Order No: 142-Edu of 2017 dated: 24-03-2017. Acceptance of technical resignation of Dr. Hashim Iqbal Malik,Lecturer(History) from the Jammu & Kashmir School Education(Gazetted) Service and termination of lien thereof. Government Order No: 141-Edu of 2017 dated: 24-03-2017. Institution of mechanism in terms of Government Order No.252-HE of 2012 dated 30.05.2012 regarding degrees obtained through distance mode -abeyance thereof Government Order No: 140-Edu of 2017 dated: 23-03-2017. Compassionate appointment of Ms.Diksha Sharma,D/o Late Suraj Parkash(Ex-Master),R/o Kotli Shah Doula District Jammu ,under SRO-43 of 1994. Government Order No: 139-Edu of 2017 dated: 23-03-2017. Relaxation in rules for operation of wait list,adjunct to select list of teachers in District cadre Ramban. Government Order No: 138-Edu of 2017 dated: 23-03-2017. Contempt No. 129/2017 in SWP No.2769/2016 titled Shamshad Hussain Shah and Others V/S State and others. Government Order No: 137-Edu of 2017 dated: 23-03-2017. SWP No.2536/2013 titled Munir hussain and others V/S State and Others. Government Order No: 136-Edu of 2017 dated: 23-03-2017. Final/Updated seniority list of PG Masters/Teachers in the discipline of Philosophy. Government Order No: 135-Edu of 2017 dated: 22-03-2017. Contempt No: 128/2015 in SWP No. 2052/2014 titled Shahida Banoo V/S State and Others. Government Order No: 134-Edu of 2017 dated: 22-03-2017. Updated seniority list of PG Masters/Teachers in the discipline of Political Science. Government Order No: 133-Edu of 2017 dated: 22-03-2017. Release of funds in favour of Principal Sainik School Manasbal for the year 2016-17. Government Order No: 132-Edu of 2017 dated: 22-03-2017. Release of funds in favour of Principal Sainik School Manasbal for the year 2016-17. Government Order No: 131-Edu of 2017 dated: 22-03-2017. SWP No.1178/2013 CMP No. 1880/2013 titled Amanullah V/S State and Others. Government Order No: 130-Edu of 2017 dated: 20-03-2017. OWP No.1583/2007 CMA No. 1000/2015 titled Syed Kazim Shah and others V/S State and Others. Government Order No: 129-Edu of 2017 dated: 20-03-2017. OWP No.1801/2016 titled J&K Private School Association and others V/S State & others and OWP No. 1837/2016 titled Rakesh kumar & others V/S State & Others. Government Order No: 128-Edu of 2017 dated: 20-03-2017. Updated seniority list of PG Masters/Teachers in the discipline of Sanskrit. Government Order No: 127-Edu of 2017 dated: 20-03-2017. Release of additional funds under Capex Budget 2016-17. Government Order No: 126-Edu of 2017 dated: 18-03-2017. Release of additional funds under capex Budget 2016-17. Government Order No: 125-Edu of 2017 dated: 18-03-2017. Sanction of advance drawal of Rs. 10.00 lac for Educational tour 2016-17. Government Order No: 124-Edu of 2017 dated: 18-03-2017. Transfers and Postings of Principals. Government Order No: 123-Edu of 2017 dated: 17-03-2017. Release of additional funds under Capex Budget 2016-17. Government Order No: 122-Edu of 2017 dated: 17-03-2017. Disengagement of services of Sh.Kuldeep kumar,working on academic arrangement basis at Government Higher Secondary School,Keerian. Government Order No: 121-Edu of 2017 dated: 17-03-2017. Re-structuring of examination system to increase teaching days;provide opportunity to students to save academic year and introduce transparency. Government Order No: 119-Edu of 2017 dated: 15-03-2017. SWP No.891/2006 titled Yog Raj and others V/S State and others. Government Order No: 118-Edu of 2017 dated: 15-03-2017. Release of additional funds under Capex Budget 2016-17. Government Order No: 117-Edu of 2017 dated: 15-03-2017. Relaxation in rules for operation of wait list,adjust to select List of Teacher,District Cadre Kishtwar. Government Order No: 116-Edu of 2017 dated: 15-03-2017. Inter-district transfer of Smt.Suman Bala,Teacher,GHSS Hardushora, from District Baramulla to District Samba on marriage grounds. Government Order No: 115-Edu of 2017 dated: 14-03-2017. Capex Budget 2016-17:Release of funds. Government Order No: 114-Edu of 2017 dated: 14-03-2017. Release of funds as 'Grant in Aid' under SSA for the financial year 2016-17. Government Order No: 113-Edu of 2017 dated: 14-03-2017. Recognition of Private Schools. Government Order No: 111-Edu of 2017 dated: 09-03-2017. Post facto sanction for medical treatment of Late Abhinandan Bhat S/o Sh. Satish Kumar Bhat, Master, CAO Migrant Cell, Jammu at PGI Chandigarh. Government Order No: 110-Edu of 2017 dated: 09-03-2017. Post facto sanction for treatment outside the state in favour of Mtr. Shabeena Ali Teacher GMS Mantrigam Bandipora. Government Order No: 109-Edu of 2017 dated: 09-03-2017. Regularization of Adhoc/Contractual/ Consolidated Employees working in the School Education Department. Government Order No: 108-Edu of 2017 dated: 09-03-2017. Delegation of drawing and disbursing powers to newly upgraded High School, Kanga(Ramban). Government Order No: 107-Edu of 2017 dated: 09-03-2017. Delegation of drawing and disbursing powers to newly upgraded Higher secondary School Mahoo (Ramban). Government Order No: 106-Edu of 2017 dated: 09-03-2017. Inter-district transfer of Mtr. Kausar Jan, Teacher Primary School Vessu, Qazigund, from District Anantnag to District Pulwama on marriage grounds. Government Order No: 104-Edu of 2017 dated: 08-03-2017. Inter-district transfer on mutual/reciprocal basis of Mtr. Shafeeqa Hamid, Teacher, UPS Keegam, District Shopian and Sh. Mushtaq Ahmed Najar, Teacher, GHSS Hawal, District Pulwama. Government Order No: 103-Edu of 2017 dated: 08-03-2017. Inter-district transfer of Mtr. Nayeema Jan, Teacher GHS Manigam, from District Ganderbal to District Anantnag on marrige grounds. Government Order No: 102-Edu of 2017 dated: 08-03-2017. Inter-district transfer Smt.Pallvi Bamotra, Teacher,Govt Girls Middle School, Parliwand,Zone kathua for transfer to District Smba on medical grounds. Government Order No: 101-Edu of 2017 dated: 08-03-2017. Inter-district transfer Smt.sunita kumari Teacher Govt. M.S Boys mankote,Zone Mankote District Poonch to Ditrict Samba on marriage grounds. Government Order No: 100-Edu of 2017 dated: 08-03-2017. Inter-district transfer Shri Akshay Parihar,Teacher ,Govt Higher Secondary School,Jhiri ,District Jammu and Ranjana Sharma,Teacher Govt Middle School,Malikpora Dool,Zone Naqseni,District Kishtwar on reciprocal basis. Government Order No: 99-Edu of 2017 dated: 08-03-2017. Inter-district transfer Smt. Savita kumari, Teacher Govt Girls School, Kootah District Kathua and Smt sunana Verma, Teacher Govt Middle School, Ratnal, District Jammu on reciprocal basis. Government Order No: 98-Edu of 2017 dated: 08-03-2017. Inter-district transfer of Mtr. Najma Rasool, Teacher, Boys Higher Secondary School Unisoo, from District Kupwara to District budgam on Marrige grounds. Government Order No: 97-Edu of 2017 dated: 08-03-2017. Transfer of Mtr. Zahida Begum, Teacher, Middle School Baderkal Handwara, Zone Rajwar, from District Kupwara to District Srinagar on security grounds for a period of two years. Government Order No: 96-Edu of 2017 dated: 08-03-2017. Inter-district transfer on mutual /reciprocal basis of Mtr. Mahruk Tabasum, Teacher , MS Papchan, District Bandipora and Mtr. Sakina Bano, Teacher ,BPS Rawatpora Delina, Zone Singhpora-Kalan, district Baramulla. Government Order No: 95-Edu of 2017 dated: 08-03-2017. Deputation of officers for attending the Programme Approval Board Meeting(PAB) of SSA/Mid Day Meal (MDM) Scheme and Teacher Education for the year 2017-18. Government Order No: 94-Edu of 2017 dated: 08-03-2017. Inter-district transfer Smt Sushma kumari teacher GMS Bakhar Tehsil Sunderbani,Disrtict Rajouri to District Samba on Security grounds. Government Order No: 93-Edu of 2017 dated: 08-03-2017. Submission of AWP & B 2017-18 under CSS Teacher Education-Deputation thereof. Government Order No: 92-Edu of 2017 dated: 07-03-2017. Updated seniority list of PG Masters/Teachers in the discipline of Arabic. Government Order No: 91-Edu of 2017 dated: 07-03-2017. Inter-district transfer of Mtr.Samina Draboo,Teacher,GMS Kadlabal,from District Pulwama to District Srinagar on marriage grounds. Government Order No: 90-Edu of 2017 dated: 07-03-2017. Award of J&K State Government Scholarship for the year 2016-17. Government Order No: 89-Edu of 2017 dated: 07-03-2017. Inter-district transfer of Mtr. Nagina Bano,Teacher,Govt.Middle School C.R.Khan,Singhpora, Pattan , from District Baramulla to district Srinagar on marriage grounds. Government Order No: 88-Edu of 2017 dated: 07-03-2017. Deputation of Smt. Rasheeda Begum,Master , Govt. High School saliskote, District Kargil of School Educaion department to the Elementary Education,Govt. of Himachal Pradesh. Government Order No: 87-Edu of 2017 dated: 06-03-2017. Capex Budget 2016-17 : Release of funds. Government Order No: 86-Edu of 2017 dated: 04-03-2017. Suspension of officers/officials associated with opening of unscheduled questions papers. Government Order No: 85-Edu of 2017 dated: 04-03-2017. Placement of PG Master as I/C Lecturer in the discipline of zoology Government Order No: 84-Edu of 2017 dated: 03-03-2017. Inter-district transfer of Smt.Gurmeet kour, Teacher,Govt.Boys High School, Narbal, from District Budgam Jammu on marriage grounds. Government Order No: 83-Edu of 2017 dated: 02-03-2017. Transfer of Mtr. Shamshada Begum,Teacher,UPS Kawari,Zone Trehgam, from District Kupwara to District Budgam on security grounds for a period of two years. Government Order No: 82-Edu of 2017 dated: 02-03-2017. Release of funds in favour of Principal Sainik School Manasbal for the year 2016-17. Government Order No: 81-Edu of 2017 dated: 02-03-2017. Assignment of duties to Joint Directors of Education Department. Government Order No:74-Edu of 2017 Dated 27.02.2017. Regularization of S/ Shri K.K. Sethi and Rajinder Singh, Lecturers (Mathematics). Government Order No:73�Edu of 2017 dated: 27/02/2017. "100% Female Literacy Mission " Document - Deputation of Officers. Government Order No. 70-Edu of 2017 Dated 20.02.2017. Inter-district transfer of Mtr.Meema Bano,Library Assistant,Govt.High Schol Batpora, from Budgam to District Ganderbal on marriage grounds. Government Order No. 68-Edu of 2017 Dated 20.02.2017. Charter of Duties of functionaries of the Department of School Education. Government Order No. 67-Edu of 2017 Dated 16.02.2017. Institution of mechanism in terms of Govenment Order No. 252-HE of 2012 dated 30.05.2012 regarding degrees obtained through distance mode. Government Order No. 66-Edu of 2017 Dated 16.02.2017. Sanction of Advance Drawal for Medical Treatment in favour of Mr. Azad Hussain Sheikh Lect.BHSS Bandipora. Government Order No. 64-Edu of 2017 Dated 16.02.2017. Release of Subsistence Allowance in favour of Sh. Abdul Qayoom Wani,I/C Headmaster. Government Order No. 63-Edu of 2017 Dated 15.02.2017. Cancellation of transfer of Lecturers to frontier districts of Leh/Kargil. Government Order No. 62-Edu of 2017 Dated 15.02.2017. Contempt No: 81/2016 in SWP No: 1826/2015 titled Ram Lal Bhatti V/s State and others. Government Order No. 61-Edu of 2017 Dated 15.02.2017. Compassionate appointment case of Mr.Vijay Pal Singh,S/o S.Gurbaksh Singh and Late Smt.Charanjeet kour (Ex-Class-IV),R/O Gulshanpora, Tral,District Pulwama,under SRO-43 of 1994. Government Order No. 60-Edu of 2017 Dated 14.02.2017. Award of J&K State Government Scholarship for the year 2014-15. Government Order No. 59-Edu of 2017 Dated 13.02.2017. Transfer of Smt.Pardeep kour,I/C Lecturer(EVS),HSS Waterhail,Budgam to Jammu Division Government Order No. 58-Edu of 2017 Dated 07.02.2017. Placement of PG Teacher as I/C Lecturer in the discipline of Environmental Sciences(EVS). Government Order No. 57-Edu of 2017 Dated 07.02.2017. Appointment of Inquiry Officer to enquire into the charges framed against Mr.Asrar Majeed,Teacher,Gvt.M/S Amira Kadal,Srinagar. Government Order No. 56-Edu of 2017 Dated 07.02.2017. Compassiante appointment of Ms.Palvi Sharma,D/o Nain Chand sharma,and Late Smt. Ram Pyari Sharma (Ex-Teacher) R/o village Bhajwal,Tehsil sunderbani,District Rajouri,under SRO-43 of 1994. Government Order No. 55-Edu of 2017 Dated 07.02.2017. Post facto sanction of Scholarship to children of Army Personnel killed in War. Government Order No. 54-Edu of 2017 Dated 07.02.2017. Release of 3rd installment of Center share under Saakshar Bharat Mission (SBM) for the year 2016-17-Sanction of advance Drawl thereof. Government Order No. 53-Edu of 2017 Dated 07.02.2017. Inter-district transfer on mutual basis of Ruchi kesar,Teacher,Govt Higher Secondary School ,Panthal , District Reasi and Vaishali Sharma,Teacher,high school Jib,District Udhampur, Government Order No. 52-Edu of 2017 Dated 03.02.2017. "National Consultative meet in shalla Siddhi(National Programme on School Standards & Evaluation)"-Deputation thereof. Government Order No. 51-Edu of 2017 Dated 02.02.2017. Inter-district transfer on mutual basis of Aaliya Jeelani Teacher,Govt High school Chareel Banihal,District Ramban and Imtyasz Runyal,Teacher GHS Chatterhama Srinagar. P.S.Kallar, Zone kanuyian from District Poonch to district Rajouri on marriage grounds. Government Order No. 50-Edu of 2017 Dated 01.02.2017. Inter-district transfer of Mtr Sameena Firdose,Teacher,Govt P.S.Kallar, Zone kanuyian from District Poonch to district Rajouri on marriage grounds. Government Order No. 49-Edu of 2017 Dated 01.02.2017. SWP No.2637/2016 titled Mohd.Aslam V/S State and others. Government Order No. 48-Edu of 2017 Dated 31.01.2017. Regularization of Adhoc/Contractual/Consolidated Employees working in the School Education Department. Government Order No. 47-Edu of 2017 Dated 31.01.2017. Release of Recurring grants to the State Govt. of J&K for the implementation of Integrated Madhyamik Shiksha Abhiyan Programme(RMSA), for the year 2016-17. Government Order No. 46-Edu of 2017 Dated 30.01.2017. Release of Non-recurring grants to the State Govt. of J&K for implementation of Integrated Rashtriya Madhyamik Shiksha Abhiyan Programme(RMSA),for the year 2016-2017. Government Order No. 45-Edu of 2017 Dated 30.01.2017. Inter-district transfer of Mtr. Attiya Nazir, Teacher, HS Sedow,from District Shopian to District Rajouri on marriage grounds. Government Order No. 44-Edu of 2017 Dated 30.01.2017. Inter-district transfer of Mtr. Nahida Noor, Teacher, HS GB Khalil Sangam,from District Anantnag to District Bandipora on marriage grounds. Government Order No. 42-Edu of 2017 Dated 27.01.2017. Recommendations of Empowered Committee in the Finance Department vide no. FD/Coord/27/2013 dated 19.10.2015. Government Order No. 41-Edu of 2017 Dated 27.01.2017. SLP No.22828/2013 titled Rajni Singh V/S State and others. Government Order No. 40-Edu of 2017 Dated 27.01.2017. Withdrawal of placement of PG Teacher as I/C Lecturer in the discipline of Botany. Government Order No. 39-Edu of 2017 Dated 27.01.2017. Placement of Headmasters and equivalent as I/C Zonal Education Officers and equivalent Government Order No. 38-Edu of 2017 Dated 27.01.2017. Re-instatement/Cancellation of transfer of Mr. Billawer Ahmad Zargar,Lecturer(Botany) to Leh District. Government Order No. 37-Edu of 2017 Dated 27.01.2017. Release of funds in favour of Principal Sainik School Nagrota for the year 2016-17. Government Order No. 36-Edu of 2017 Dated 25.01.2017. Release of funds in favour of Principal Sainik School Nagrota for the year 2016-17. Government Order No. 35-Edu of 2017 Dated 25.01.2017. Release of funds in favour of Principal Sainik School Manasbal for the year 2016-17. Government Order No. 34-Edu of 2017 Dated 25.01.2017. Release of funds in favour of Principal Sainik School Manasbal for the year 2016-17. Government Order No. 33-Edu of 2017 Dated 25.01.2017. Repatriation of Mtr.Urfana amin Moharken,I/C Master. Government Order No. 32-Edu of 2017 Dated 24.01.2017. Placement of PG Masters as I/C Lecturer in the discipline of Zoology. Government Order No. 31-Edu of 2017 Dated 23.01.2017. Appointment of Sh. Abid Hussain,KAS,Joint Director,Education,South Kashmir,as Inquiry Officer. Government Order No. 30-Edu of 2017 Dated 23.01.2017. Inter-cadre transfer of Smt. Anita Devi,Teacher, Govt. High school Goose,from District Goose kupware to District Samba for one year.. Government Order No. 29-Edu of 2017 Dated 23.01.2017. Inter-District transfer of Smt.Namarta kumari,Teacher, Govt. Higher secondary school (Boys)Reasi to District Udhampur on marriage grounds. Government Order No. 28-Edu of 2017 Dated 18.01.2017. Placement of PG Masters as I/C Lecturers in the discipline of Urdu. Government Order No. 27-Edu of 2017 Dated 18.01.2017. Inter-district transfer of Mr. Mohd. Amin Sofi, Teacher, Boys High School, Lokipora, Langate from District Kupwara to District Anantnag. Government Order No. 26-Edu of 2017 Dated 17.01.2017. Inter-district transfer of Mtr. Aalia Yousuf Shah, Teacher, Ups Wangam, Zone Langate from District Kupwara to District Baramulla on marriage grounds. Government Order No. 25-Edu of 2017 Dated 17.01.2017. Withdrawal of Rs.6.75 lacs from DIET kud and its reallocation for installation for 100 KVA transformer at DIET office Tarore,Samba. Government Order No. 24-Edu of 2017 Dated 17.01.2017. Release of 2nd instalment of grants under SSA for the year 2016-17 to SSA, Jammu and Kashmir. Government Order No. 23-Edu of 2017 Dated 16.01.2017. Release of funds in favour of Principal Sainik School Manasbal for the year 2016-2017. Government Order No. 22-Edu of 2017 Dated 16.01.2017. Regional Workshop on School Educational quality Index-Deputation thereof. Government Order No. 21-Edu of 2017 Dated 16.01.2017. Regularization of Adhoc/Contractual/Consolidated Employees working in the School Education Department:Governemnt Order No. 19-Edu of 2017 Dated 11.01.2017. Deputation of Kuldeep Kumar, Teacher Government Primary School Bathua Zone Dansal Jammu to University of Jammu. Government Order No.18-Edu of 2017 Dated 11.01.2017. Post-facto sanction for treatment outside the state in favour of Mr. Abid Nabi Teli, Teacher, Boys Higher Secondary School, Batwina. Government Order No.17-Edu of 2017 Dated 10.01.2017. Inter-district transfer of Mtr. Shahnaz Akhter, Teacher BMS Laroo, from District Kulgam to District Rajouri on marriage grounds Governemnt Order No. 16-Edu of 2017 Dated 09.01.2017. Inter-district transfer of Smt Meenakshi Chanda, Teacher Govt Middle School Langer, Zone Gandhi Nagar, District Jammu to District Kathua on marriage grounds Governemnt Order No. 15-Edu of 2017 Dated 09.01.2017. Inter-district transfer of Smt Gurpreet Kour, Teacher GMS Udhampur, from District Udhampur to District Rajouri on marriage grounds Governemnt Order No. 14-Edu of 2017 Dated 09.01.2017. Inter-district transfer of Smt Sonia Thakur, Teacher Govt Primary School, Zulla Zone Reasi from District Reasi to District Samba on marriage grounds Governemnt Order No. 13-Edu of 2017 Dated 09.01.2017. Case SWP No.75/ 2014 titled Narinder Kumar Sharma V/s State and Others Governemnt Order No. 12-Edu of 2017 Dated 07.01.2017. Case SWP No.75/ 2014 titled Narinder Kumar Sharma V/s State and Others Governemnt Order No. 11-Edu of 2017 Dated 07.01.2017. Compassianate appointment of Mtr.Fatima Banoo W/o late Ghulam Nabi R/o Loundri,Tehsil Drabshalla,District Kishtwar,under SRO-43 of 1994. Governemnt Order No. 10-Edu of 2017 Dated 07.01.2017. Placement of PG Masters as I/C Lecturers in the discipline of Botany. Governemnt Order No. 09-Edu of 2017 Dated 07.01.2017. Placement of PG Masters as I/C Lecturers in the discipline of Bio-Technlogy. Governemnt Order No. 08-Edu of 2017 Dated 07.01.2017. Voluntary retirement of Mtr. Masooda,I/C Head Assistant,ZEO's Office kakapora. Governemnt Order No. 07-Edu of 2017 Dated 04.01.2017. Mutual transfer of Rabia Zaffer,Teacher,Govt Middle School Sawany Buffliaz District Poonch and Mumtaz Ahmed Manzoor,Teacher,Govt Middle school Chatterhama District Srinagar. Governemnt Order No. 06-Edu of 2017 Dated 04.01.2017. Delegation of drawing and disbursing powers to newly upgraded Govt.High Schools,Ritti(Udhampur). Governemnt Order No. 05-Edu of 2017 Dated 04.01.2017. Delegation of drawing and disbursing powers to newly upgraded Govt.High Schools,Kishanpur(Jammu). Governemnt Order No. 04-Edu of 2017 Dated 04.01.2017. Delegation of drawing and disbursing powers to newly upgraded Govt.High Schools, Gangal and Panjgrain,District Jammu:Governemnt Order No. 03-Edu of 2017 Dated 04.01.2017. Winter Vacation in the Schools falling in Summer Zone of Jammu Division. Governemnt Order No. 02-Edu of 2017 Dated 03.01.2017. Inter- district/ Inter Provincial transfer of Smt. Seema Devi, teacher, UPS Doomwani, from District Shopian to District Samba, on marriage grounds Governemnt Order No. 506-Edu of 2016 Dated 27.12.2016. Placement of PG Masters as I/C Lecturers in the discipline of (Urdu)- Posting thereof. Governemnt Order No. 505-Edu of 2016 Dated 27.12.2016. Inter- Provincial transfer of Smt. Rekha Devi, I/C Master, GMS Bonpora Wanpora Zone Qazigund, from District Anantnag to District Doda, on marriage grounds. Governemnt Order No. 504-Edu of 2016 Dated 26.12.2016. Deputation of SPD SSA/RMSA to New Delhi for attending meeting on 15th and 16th of December, 2016 Governemnt Order No. 503-Edu of 2016 Dated 26.12.2016. Release of funds in favour of Principal Sainik School Nagrota for the Year 2016-17. Governemnt Order No. 501-Edu of 2016 Dated 23.12.2016. Placement of PG Masters as I/C Lecturers in the discipine of Urdu. Governemnt Order No. 500-Edu of 2016 Dated 23.12.2016. Relaxation of rules for operation of wait list, adjunct to select List of Teachers in District Kathua, in pursuance to Notification No.3 of 2012, 05 of 2013 and 06 of 2013, under Item Nos: 354,483 & 484 respectively. Governemnt Order No. 499-Edu of 2016 Dated 23.12.2016. Acceptance of resignation of Mtr. Aliya Muzaffer,Ex-Leturer(English) from the Jammu and Kashmir School Education(Gazetted) Service-termination of lien thereof. Governemnt Order No. 498-Edu of 2016 Dated 23.12.2016. Release of funds in favour of Principal Sainik School Manasbal for the year 2016-17. Governemnt Order No. 497-Edu of 2016 Dated 23.12.2016. Deputation of Mr. Mubashir Hassan, Lecturer(Zoology) to J&K State Sports Council. Governemnt Order No. 496-Edu of 2016 Dated 23.12.2016. Inter- Provincial/ Inter-district transfer of Mtr. Kulsoom Akhter, Taecher, GPS Zachaldara Zone Rajwara, from District Kupwara to District Rajouri, on marrioage grounds. Governemnt Order No. 494-Edu of 2016 Dated 22.12.2016. Delegation of drawing and disbursing powers to newly upgarded Govt. High School, Chachwah, Dsitrict Ramban. Governemnt Order No. 493-Edu of 2016 Dated 22.12.2016. Change of Nomenclature in respect of Public Model High School, Mai Basti, Anantnag, to Coty School, Anantnag. Governemnt Order No. 492-Edu of 2016 Dated 22.12.2016. Inter-district tansfer on mutual/reciprocal basis of Mtr. Ishrat Habib, Teacher, UPS Bahadurpora, District Kupwara and Mtr. Shahla Ayoub, Teacher, BHS Balhama, District Srinagar Governemnt Order No. 491-Edu of 2016 Dated 22.12.2016. Raising of Dietary Charges for students of Sainik School Manasbal from Rs. 65/ to Rs. 100/ per day per student. Governemnt Order No. 490-Edu of 2016 Dated 19.12.2016. Inter-District transfer of Mtr. Sunaina Hamid, Teacher, Govt. Middle School, Drogian(Zone Bufliaz) from District Poonch to District Rajouri on marriage grounds. Governemnt Order No. 489-Edu of 2016 Dated 14.12.2016. Inter-district transfer of Mtr.Shafiqa Akhter, Teacher, UPS Chandi Kulgam, from District Kupwara to District Budgam, on marriage grounds. Governemnt Order No. 488-Edu of 2016 Dated 14.12.2016. Inter-district transfer of Mtr. Kilsuma Jan, Teacher, BPS Narpora, from District Shopian to District Pulwama, on marriage grounds. Governemnt Order No. 487-Edu of 2016 Dated 13.12.2016. Inter-District transfer of Mtr. Shahzada Parveen, Teacher, PS Mataygund, from District Anantnag to District Kulgam, on Marriage grounds. Governemnt Order No. 486-Edu of 2016 Dated 13.12.2016. Transfer of Mtr. Nusrat Khan, Senior Lecturer(Political Science) from GHSS Jhulaka Muhalla Jammu to Kashmir Province. Governemnt Order No. 484-Edu of 2016 Dated 13.12.2016. Inter-district transfer of Mtr. Noghat Shahnaw, Teacher,High School Supernaghama fom District Kupwara to Distrct Baramulla, on marriage grounds. Governemnt Order No. 482-Edu of 2016 Dated 13.12.2016. SWP No: 1607/2016 titled Satya Dev Singh alias Satia Dev V/S State and others. Governemnt Order No. 481-Edu of 2016 Dated 13.12.2016. Withdrawal of Rs. 39.87 lacs from DIET Kud and its reallocation for Construction of Auditorium at Govt. Girls High School Gandhi Nagar Jammu. Governemnt Order No. 480-Edu of 2016 Dated 09.12.2016. Circular instruction regarding Private Tuition: Circular No. 1-Edu of 2017 Dated 4.1.2017. Change of academic session of Schools of Zone Chinkah District Reasi: Governemnt order No. 510-Edu of 2016 dated 29.12.2016. Re-instatement of shri Pawan Kumar Singh slathia,I/C Principal. : Governemnt order No. 509-Edu of 2016 dated 29.12.2016. Re-instatement of Shri Khurshid Ahmad, I/c Principal: Government order No. 508-Edu of 2016 dated 29.12.2016. Deputation of student/teachers for particication in 6th National level Exhibition and Project Competitions (NLEPCs) under INSPIRE Award Scheme. Government Order No.478-Edu of 2016 dated 07.12.2016. Inter-district transfer of Smt Anuradha,Teacher,Govt Middle School Khandui Zone Tikri District Udhampur to District Samba on Marriage grounds. Government Order No.477-Edu of 2016 dated 07.12.2016. Constitution of Governing Body of "Noor Society"-Nomination of Retired Academician of repute. Government Order No.476-Edu of 2016 dated 06.12.2016. Initiation of Regular Department action against Ch.Mohd Aslam posted at ZEO Balakote for allegedly duping the complaint of Rs.1,66,000 on the pretext of getting employment for the latter-suspension thereof. Government Order No.475-Edu of 2016 dated 06.12.2016. Compassianate appointment of Mtr.Shahzada W/O Late Ghulam Qadir Magray(Ex-Chwkidar) R/O New Colony Batamaloo,under SRO-43 OF 1994. Government Order No. 474-Edu of 2016 dated 06.12.2016. Inter-district transfer of Mtr.Anjum Parveen,Teacher, GMS Handwara,from District Bramulla,on marriage grounds. Government Order No. 473-Edu of 2016 dated 02.12.2016. Inter-district transfer on mutual/reciprocal basis of Mtr.Shafia Abass,Teacher,HSS Wanpoh and Mr.Rafiq Ahmad Rather,Teacher,GHS Lasjan. Government Order No. 472-Edu of 2016 dated 02.12.2016. Mutual transfer of Sunil Kumar,Teacher Govt High School Mathwar District Jammu and Smt.Pallvi Gupta,Teacher Govt Higher Secondary School Bhalra(Bhaderwah) District Doda on reciprocal basis. Government Order No. 471-Edu of 2016 dated 02.12.2016. Compassinate appointment case of Ms.Meenakshi Thakur,D/o late Balwan Singh,(Ex-Master), R/o Village and VPO Treru,Tehsil Teryath,District Rajouri,under SRO-43 OF 1994. Government Order No. 470-Edu of 2016 dated 01.12.2016. Placement of PG Masters/ Teachers as I/C Lecturers in the discipline of Electronics. Government Order No. 469-Edu of 2016 dated 30.11.2016. SWP No.2649/2013 CMP No. 4306/2013 titled Mohammad Sidiq Lone and others V/S State and others. Government Order No.386-Edu of 2016 dated 05.10.2016. Criteria for permission/affiliation/recognition of Private Schools: Government Order No. 38-Edu of 2016 dated 5.10.2016. Inter-district transfer on mutual basis of Mr. Sajad Ahmad,Teacher,GMS Chatterhama Zone Gulab Bagh,District Srinagar,and MTR.Nisara Andrabi,Teacher, GPS Regipora Zone Kupwara,District Kupwara. Government Order No.377-Edu of 2016 dated 30.10.2016. SWP No.454/2016 titled Ghulam Mohammad V/S State and others. Government Order No.367-Edu of 2016 dated 28.10.2016. Prime Minister's Package for restoration of flood affected infrastructure revalidation of unspent funds. Government Order No.362-Edu of 2016 dated 28.10.2016. SWP No.434/2003 c/w SWP No. 735/2004 titled Shakeela Rehman and others V/S State and others. Government Order No.363-Edu of 2016 dated 28.10.2016. Order No. 109-119-Edu of 2016 dated 20.9.2016. Order No. 98-108-Edu of 2016 dated 20.9.2016. Order of Committee for Fixation of Fee Structure of Private Educational Institutions of J&K State regarding fee structure of 1. St. Peter's International Academy Educational Trust. 2. Khalsa High School. 3. Alamdar Public School 4. Zaffran public Secandary School 5. Classic Public School 6. New Era Model School 7. Caset Experimental School 8. Universal Public High School 9. Public Model School 10. Lavender Convent School. Order of Committee for Fixation of Fee Structure of Private Educational Institutions of J&K State regarding fee structure of 1, Hanifa Institute (High School), 2. Standard Public High School 3. Dreamland Public School 4. Al Huda Educational Institute 5. Bangil Educational Institute 6. Evergreen Public School 6 The Gousia Educational Institute 7. Caset hr Sec School 8. Balmy School English Medium 9. Fayaz Educational Institute 10. Modern Public School. Transfers/Postings of Lecturers to districts of Leh and Kargil : Government Order No. 379-Edu of 2016 dated 30.9.2016. Transfers/Postings of Lecturers from/to the districts of Leh and Kargil and suspension thereof. : Government Order No. 378-Edu of 2016 dated 30.9.2016. Transfers/Postings of Principals & equivalents: Government Order No. 369-Edu of 2016 dated 28.9.2016. Deputation of Nodal Officers (INSPIRE Award Scheme) for participation in Regional Workshop at New Delhi: Government Order No. 359-Edu of 2016 dated 27.9.2016. Transfer/posting of Sh. Ghulam Hassan War,Lecturer(English), to DIET Leh:	Government Order No. 357-Edu of 2016 dated 23.9.2016. Cancellation of transfer of Mr Shamim Ahmad Shamim ,Lecturer(Chemistry)to Kargil district: Government Order No. 356-Edu of 2016 dated 23.9.2016. Cancellation of transfers of Lecturers posted in the districts of Leh and Kargil: Government Order No. 355-Edu of 2016 dated 23.9.2016. Cancellation of transfers of Lecturers posted in Leh and Kargil Districts: Government Order No. 354-Edu of 2016 dated 23.9.2016. Transfers/Postings of Lecturers from/to Leh and Kargil Districts: Government Order No. 353-Edu of 2016 dated 23.9.2016. Inter-district transfer of Smt Rajni Khajuria, Teacher, Govt Middle School, Thein Zone Sallan, District Kathua to District Samba on marriage grounds: Government order No. 351-Edu of 2016 dated 23.9.2016. Inter-district transfer of Smt Sunaina Magotra, Teacher, Govt Girls High School Ramban,, District Ramban to District Samba on marriage grounds: Government order No. 349-Edu of 2016 dated 22.9.2016. Release of funds in favour of Principal Sainik School, Manasbal for the year 2016-17: Government order No. 348-Edu of 2016 dated 22.9.2016. Inter-district transfer of Smt Anita Andotra, Teacher, Govt Middle School Marchola Zone Lower Hathal, District Rajouri to District Kathua on medical grounds: Government order No. 347-Edu of 2016 dated 22.9.2016. Inter-district transfer of Smt Anjana Gupta, Teacher, Govt High School Dinga Amb, District Kathua to District Samba on marriage grounds: Government order No. 346-Edu of 2016 dated 22.9.2016. Inter-district transfer on mutual basis of Mtr Saba Afroz, Teacher, PS Chirgari Mohalla Eidgah district Srinagar and Mtr Sadia Hafiz, Teacher, HS Bemina District Budgam: Government order No. 345-Edu of 2016 dated 21.9.2016. SWP No. 893/2015 & CMP No. 01/2015 titled Abid Hussain Khan & others v/s State & others: Government order No. 344-Edu of 2016 dated 21.9.2016. Delegation of drawing and disbursing powers to newly upgraded High School, Sultan District Udhampur: Government Order No. 342-Edu of 2016 dated 20.9.2016. Delegation of drawing and disbursing powers to Govt. High School, Sarhi District Reasi: Government Order No. 341-Edu of 2016 dated 20.9.2016. Appointment of Inquiry officer to enquire into the charges framed against Shri Mohammad Akbar Mir, the then I/c ZEO Khumriyal, Kupwara (now retired): Government Order No. 340-Edu of 2016 dated 16.9.2016.
Review of Policy of "No Detention" up to elementary level, conduct of assessment and evaluation and improved implementation of continuous and comprehensive Evaluation(CCE) Government Order No. 338-Edu of 2016 dated 16.9.2016. Revalidation of Upsent Balance of Centre Share for the year 2015-16 under National programme of Mid Day Meal in Schools: Government Order No. 337-Edu of 2016 dated 12.9.2016. Corrigendum to Government Order No. 119-Edu of 2016 dated 8.9.2016. Recognition of Private Schools:Government Order No. 336-Edu of 2016 dated 8.9.2016. Post facto Sanction of Medical treatment outside the State in favour of Smt. Jaya Kumari, Teacher, CAO Migrant cell: Government Order No. 335-Edu of 2016 dated 8.9.2016. Placement of PG masters/Teachers as I/c Lecturers in the discipline of Kashmiri: Government Order No. 334-Edu of 2016 dated 7.9.2016. Updated/ Final seniority list of PG Masters/Teachers in the discipline of Kashmiri: Government Order No. 333-Edu of 2016 dated 7.9.2016. Withdrawal of elevation of I/c Lecturers (non-joining) in the discipline of Kashmiri: Government Order No. 332-Edu of 2016 dated 7.9.2016. Workshop on ICT@ School Component of RMSA on 8th September, 2016 by MHRD, GOI: Government Order No. 331-Edu of 2016 dated 6.9.2016. Inter-district transfer of Mtr. Neelofar Bano, Teacher, BPS Sumbal from District Bandipora to District Budgam on marriage grounds: Government Order No. 330-Edu of 2016 dated 6.9.2016. SRO 290- Revision of minimum qualification for direct recruitment of teachers dated 6th September, 2016. SWP No. 1343/2002 titled Rehana Ashai Vs State and Ors: Government Order No. 329-Edu of 2016 dated 5.9.2016. 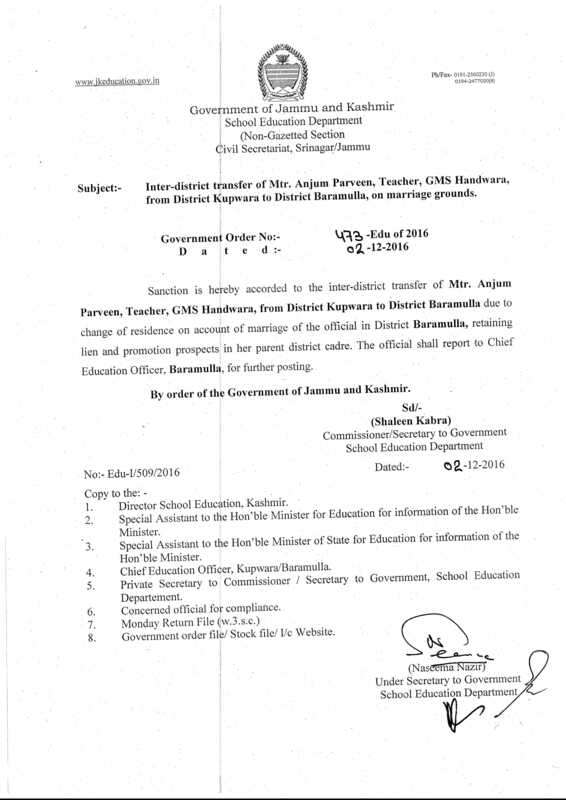 Inter-district transfer of Mtr Tasleema Tabassum, Teacher, GUPS Karihama from District Kupwara to District Anantnag on marriage grounds: Government Order No. 328zEdu of 2016 dated 5.9.2016. Deputation of DIET Principals to Udaipur Rajasthan for participation in seminar organized by CCRT New Delhi: Government Order No. 327-Edu of 2016 dated 2.9.2016. Inter-District transfer on mutual basis of Syed Anjum Afshan, GMS, Gund Hassibat, Srinagar and Syed Qurat-ul-Ain BMS Shopian: Government Order No. 326- Edu of 2016 dated 01.9.2016. Inter-provincial/Inter-district of Mtr Masarat Naseem Akhter, Teacher, Middle School Tengwani from District Shopian to District Poonch on marriage grounds: Government Order No. 325- Edu of 2016 dated 01.9.2016. Inter-district transfer on mutual basis of Mr Mukhtar Ahmad Shah, Teacher, BMS Hyderpora, District Srinagar and Mtr Nusrat Hameed, Teacher, BHS Ompora, distrct Budgam: Government Order No. 324- Edu of 2016 dated 01.9.2016. Release of funds in favour of Principal Sainik School Nagrota for the year 2016-17: Government Order No. 323- Edu of 2016 dated 30.8.2016. Release of funds in favour of Principal Sainik School Nagrota for the year 2016-17: Government Order No. 322- Edu of 2016 dated 30.8.2016. Release of funds in favour of Principal Sainik School Nagrota for the year 2016-17: Government Order No. 321- Edu of 2016 dated 30.8.2016. Inter-District transfer of Ms Harmeet Kour, Teacher, GHS Bedar, Zone Mandi, District Poonch and Mr Mushtaq Ahmed, Teacher, GHS Bupp, Zone Chenani, District Udhampur on resiprocal basis: Government Order No. 320- Edu of 2016 dated 30.8.2016. Inter-district transfer of Smt Renu Sharma, Teacher, Govt GHS Tarore, District Samba and Mtr Shahnaz Choudhary, Teacher, Govt HS Baliyal Rajpura Mandi district Jammu on resiprocal basis: Government Order No. 319- Edu of 2016 dated 30.8.2016. SWP No 2065/2015, MP No. 01/2015 titled Gulzar Singh v/s State of J&K and Ors: Government Order No. 318- Edu of 2016 dated 30.8.2016. Inter-district transfer of Mtr Raheela Rashid, Teacher, GPS Nowpora Mirgund from District Baramulla to District Srinagar on marriage grounds: Government Order No. 317- Edu of 2016 dated 30.8.2016. Release of funds in favour of Principal Sainik School Manasbal for the year 2016-17: Government Order No. 316- Edu of 2016 dated 30.8.2016. Delegations of drawing and disbursing powers to newly upgraded high school, Bagodh, Zone Udhampur: Government Order No. 315- Edu of 2016 dated 30.8.2016. Inter-district transfer of Smt Rekha Bala, Teacher, GPS Barnota zone R S Pura district Jammuto district Samba: Government Order No. 313- Edu of 2016 dated 29.8.2016. Inter-district transfer of Smt. 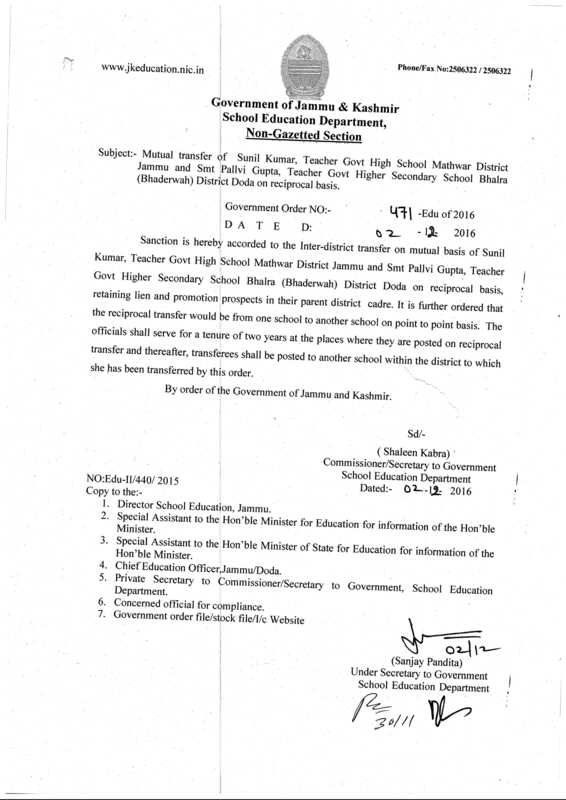 Roma Raina, Teacher, (PM's Package), GGHSS Shopian to District Anantnag: Government Order No. 312- Edu of 2016 dated 29.8.2016. Inter-district transfer of Smt. 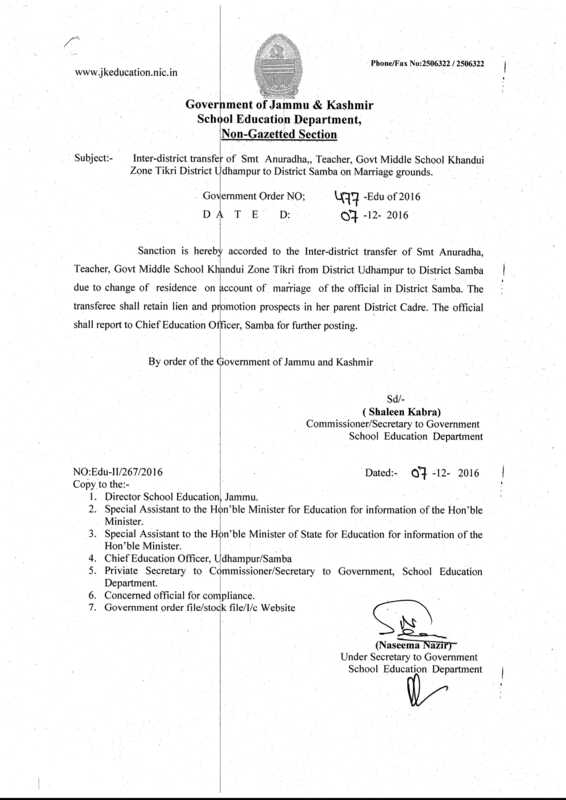 Meenakshi Bhat, Teacher, (PM's Package), PS Kharbagh from District Kupwara to District Baramula: Government Order No. 311- Edu of 2016 dated 29.8.2016. Deputation of Dr Zahoor Ahmad Raina, Personnel Officer, Directorate of School Education Kashmir to New Delhi: Government Order No. 310- Edu of 2016 dated 24.8.2016. Inter-district transfer on mutual basis of Mr Muneeb Ul Hassan, Teacher, GMS, Kralyar, District Srinagar and Mtr Tawheeda Razaq, Teacher, BHS Arhama, District Shopian: Government Order No. 309- Edu of 2016 dated 24.8.2016. Compassionate appointment under SRO 43 of 1994: Government order no 307-Edu of 2016 dated 24.8.2016. Inter-district transfer of Mtr. 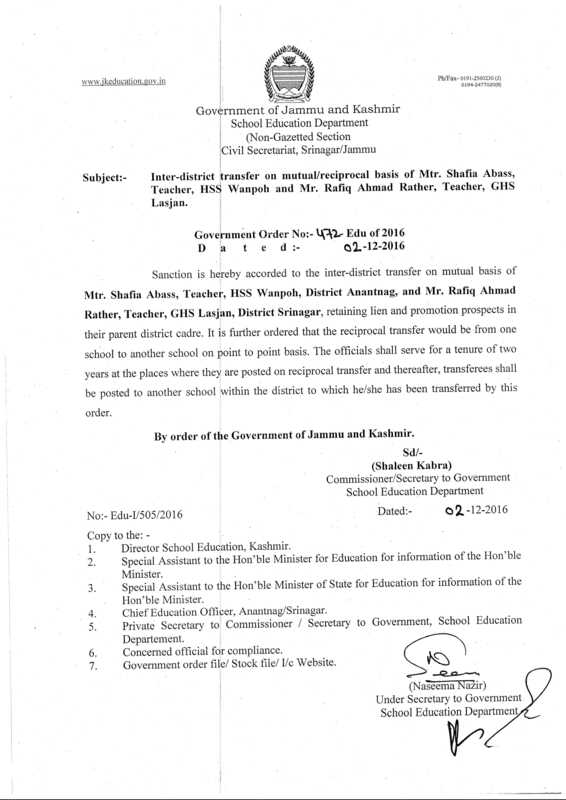 Nargis Salam, Teacher, HS Akhran from district Kulgam to district Anantnag: Government Order No. 306- Edu of 2016 dated 24.8.2016. Inter-district transfer on mutual basis of Ms Usha Devi, Teacher, Govt BPS, Haknipora District Budgam and Ms Saira Chowdhary, Teacher, GHS Gandhi Nagar, Jammu: Government Order No. 305- Edu of 2016 dated 23.8.2016. Inter-district transfer of Mtr. Nighat Firdous, Teacher, MS Mehman Mohalla from Anantnag to District Srinagar on marriage grounds. Inter-district transfer of Mtr. Nargis Salam, Teacher, HS Akhran from District Kulgam to District Anantnag on marriage grounds. Inter-district transfer on mutual basis of Ms. Usha Devi, Teacher, Govt. BPS, Haknipora District Budgam and Ms. Saira Chowdhary, Teacher, GHS Gandhi Nagar, Jammu. Release of Recurring Central Assistance for committed liability of 2014-15 under National Programme of Mid Day Meal in Schools. Inter-district transfer of Mtr. Nazia Akber, Class-IV(Lab. Bearer), GHS Sumbal Sonawari from District Bandipora to District Srinagar on marriage grounds. Inter-district transfer on mutual basis of Mr. Nisar Ahmad, Teacher, BMS Nowgam, District Srinagar and Syed Romana Shamas, Teacher, GHS Chareel District Ramban. Regularization of Mohammad Maqbool Wani as Class-IV in School education Department. Post facto sanction for treatment outside the state in favour of Legal heirs of Lt. Dewan Chand Peon, High School, Laiter, District Reasi. Sanction for Advance drawal on account of Medical treatment of Mr. Gulzar Hussain, Senior Lecturer, Boys Hr. Sec. School, Darhal Rajouri. Release of funds for the year 2015-16 under INSPIRE Award Scheme. Post facto sanction of Medical treatment outside state in favour of Smt. Poonam Gandotra, Lecturer, Hr. Sec. School Paloura. Inter-district transfer of Smt Sushma Rani, Teacher, Govt Middle School, Ichikoot (Budgam) from District Budgam to District Kathua on marriage grounds. Post facto sanction of Medical treatment outside the state in favour of Mr. Ashiq Hussain Mir, Teacher, Zone- Bhaderwah. Change of Nomenclature in respect of Public High School ,Gogjibagh, as "Oasis Educational Institute" Gogjibagh, Srinagar. Inter-district transfer on mutual basis of Mtr. Nafisa Neelofar, Treacher, GMS Gutlipora Zone Tangmarg, District Baramulla and Mr. Shah Fassal, Treacher, HS Srawan Kishtwar. Regularization of Adhoc/Contractual/consolidated employees working in the School Education Department. Post facto sanction of Medical Treatment outside the state in favour of Mr. Ashiq Hussain Mir, Teacher, Zone-Bhaderwah. Inter-District transfer of Smt. Sushma Rani, Teacher, Govt. Middle School, Ichikoot (Budgam) from District Budgam to District Kathua on marriage grounds. Transfers / Postings of I/C Principals & equivalent. Appointment of Inquiry officer to enquire into the charges framed against shri Mohammad Abdullah Rather, the then I/C ZEO Verinag now I/C ZEO Shangus. Regularization of KGBV teachers: Government order No. 242-Edu of 2016 dated 30.6.2016. Extension of Study leave in favour of Smt. Madhu Bhagat teacher HS Chiryai District Udhampur for pursuing M.Phil (Regular) in Education. Transfers/postings of Lecturers from/to the districts of Leh and Kargil. Repatriation of Sh Gh. Mohd. Bhat 1/C Lecturer Chemistry, from HSS Sankoo, Kargil to Valley. Inter-district transfer of Mtr. Sehar Jamil, Teacher, HSS Mirgund Singpora Pattan from District Baramulla to District Srinagar on security grounds. Inter-district transfer of Mtr. Shazia Chowdhary, Teacher, BMS Ichkoot from District Budgam to District Rajouri on marriage grounds. Transfer of Ms Syed Sheeba Hashmi, Lecturer, English from BHSS, Uri to Jammu. Post Facto Sanction of Medical treatment outside the State in favour of Shri Irshad Hussain, teacher GMS Arhama District Ganderbal. Cancellation of transfers of Lecturers posted in the districts of Leh and Kargil. Regularization of Adhoc/Contractual/Consolidated employees Teachers working in the School Education Department. Inter-district transfer of Mtr. Shabeena, Nazir, Teacher, MS Qaimoh from District Kulgam to District Anantnag on marriage grounds. Inter-district transfer of Smt. Sameeta Tickoo, Teacher, GBMS Bunoora, Pulwama (PM's package), from District Pulwama to District Anantnag. Settlement of period of absence w.e.f 4/2010 to 01/2012 as on duty in favour of Mr.Ab.Rashid Dar, retired I/C Lecturer (Math) HSS Wathoora- Issuance of NDC thereof. Post facto Sanction for Medical treatment outside the State in favour of Sh Altaf Hussain Safi, Sr. Assistant, School Education Department, Civil Secretariat Srinagar. Appointment of Dr. Shah Faisal, Director School Education, Kashmir as Inquiry Officer. Regularization of Promotion of the Chief Education Officer and equivalent. Suspension of Shri Arun Kumar Gupta the then I/c Headmaster, High School Gurdhan Bala, Rajouri now attached with CEO, Rajouri. Transfer and posting of I/C Principals. Release of 2nd installment of centre share under Saakshar Bharat Mission (SBM) for the year 2015-16 - Sanction of Advance Drawal thereof. Transfers and Postings of Principals and equivalent. Transfers/ postings of Lecturers from/ to the districts of Leh and Kargil: Government Order No.140-Edu of 2016 dated 12.4.2016. Transfers/ Postings of Lecturers: Government Order No. 123-Edu of 2016 dated 01.04.2016. Transfers and postings of I/C Principals and equivalent: Government Order No. 121-Edu of 2016 dated 01.04.2016. Recognition of Private Schools: Government Order No. 119-Edu of 2016 dated 01.04.2016. Notice: Regularization of I/c Headmasters and equivalents dated 15.3.2016. Transfers/postings of Leturers from/ to the districts of Leh and Kargil: Government Order No. 84-Edu of 2016 dated 14.3.2016. Regularization of Adhoc/ Contractual/ Consolidated Employees working in the School Education Department: Government Order No. 69-Edu of 2016 dated 29.02.2016. Cancellation of elevation of I/C Lecturer in the discipline of Urdu: Government Order No.54-Edu of 2016 dated 16.02.2016. Withdrawal of elevation of I/C Lecturer (non-joining) in the discipline of Urdu-notice thereof. Elevation of PG Masters/ Teachers in the discipline of Sanskrit-notice thereof. SWP No. 2390/2015 titled Salma Sultana v/s State and others: 25-Edu of 2016 dated 29.1.2016. Regularization of Adhoc/Contractual/Consolidated Employees working in the School Education Department vide Order No. 22-Edu of 2016 dated 27.1.2016. Regularization of Adhoc/Contractual/Consolidated Employees working in the School Education Department vide Order No. 21-Edu of 2016 dated 27.1.2016. Suspension of Shri Prem Nath I/c Principal: Government Order No. 632-Edu of 2015 dated 31.12.2015. Introduction of Screening Test for ReTs/RReTs: Government Order No. 631-Edu of 2015 dated 29.12.2015. Winter Vacations in the schools falling in Summer Zones of Jammu Division: Government Order no. 626-Edu of 2015 dated 23.12.2015. Transfer of Dr Saba Mughal , Lecturer Botany from DIET Rajouri : Government order No. 625-Edu of 2015 dated 23.12.2015. Transfer Policy for Employees of School Education Department: Government Order No. 622-Edu of 2015 dated 22.12.2015. Transfer/posting of I/C Principals and equivalents vide Order No. 618-Edu of 2015 dated 14.12.2015. Regularization of Adhoc/Contractual/Consolidated Employees working in the School Education Department vide Order No. 615-Edu of 2015 dated 10.12.2015. SWP No 1566/2015 titled Shaista Parveen Sirwal and another V/S State and others vide Government Order No. 611-Edu 2015 dated 1.12.2015. Corrigendum to Government Order No. 585-Edu of 2015 dated 10.11.2015. Winter vacations in Kashmir Division/winter Zones of Jammu Division vide Order No. 605-Edu of 2015 dated 26.11.2015. Placement of PG Masters/Teachers as I/C Lecturers in the discipline of Zoology. 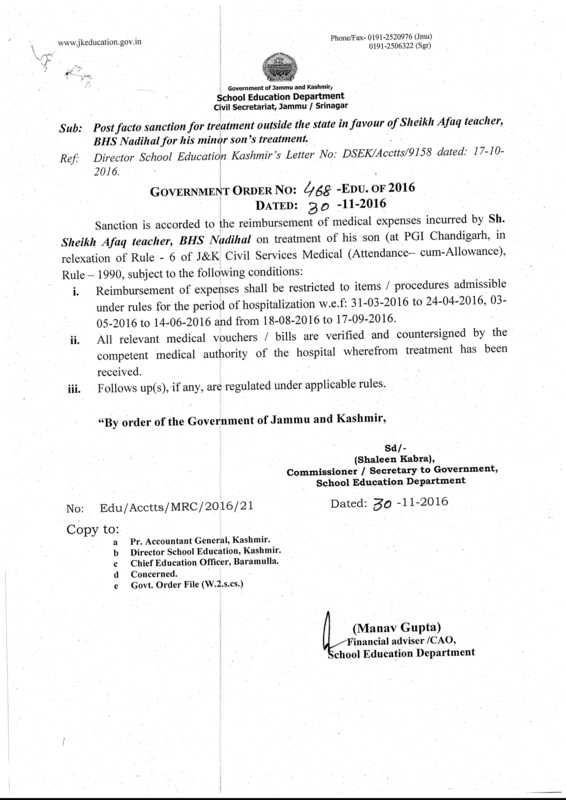 Government Order No.598-Edu of 2015 Dated 20.11.2015. Placement of PG Masters/Teachers as I/C Lecturers in the discipline of Botany. Government Order No.597-Edu of 2015 Dated 20.11.2015. Placement of PG Masters/Teachers as I/C Lecturers in the discipline of Zoology. Government Order No.585-Edu of 2015 Dated 30.10.2015. Placement of PG Masters/Teachers as I/C Lecturers in the discipline of Botany. Government Order No.583-Edu of 2015 Dated 30.10.2015. Placement of PG Masters/Teachers as I/C Lecturers in the discipline of Computer Science. Government Order No.581-Edu of 2017 Dated 30.10.2015. Regularization of Adhoc/Contractual/Consolidated Employees working in the School Education Department vide Order No. 577-Edu of 2015 dated 30.10.2015. Placement of Senior Lecturers as I/C Principals and equivalents vide Order No. 575-Edu of 2015 dated 30.10.2015. Transfer/adjustment/posting of I/C Principals and equivalents vide Order No. 574-Edu of 2015 dated 30.10.2015. Fixation of pupil Teacher ratio (PTR) in the tuition/coaching institutes vide Order No. 559-Edu of 2015 dated 27.10.2015. Regulation/registration/monitoring of tuition/coaching institutes vide Order No 558-Edu of 2015 dated 27.10.2015. Inter-District transfer of Mrs Abida Parveen, Teachere, Govt Boys Middle School Chanipora, Zone Chakote Tehsil Karnah District Kupwara to District Kupwara to District Srinagar, on security grounds vide Order No. 557-Edu of 2015 dated 26.10.2015. Placement of Headmasters and equivalent as I/C ZEO and equivalent vide corrigendum to Order No. 541-Edu of 2015 dated 20.10.2015. Cancellation of transfers of Lecturers posted in the districts of Leh/Kargil vide Order No. 555-Edu of 2015 dated 23.10.2015. Cancellation of transfers of Lecturers posted in the districts of Leh/Kargil vide Order No. 554-Edu of 2015 dated 23.10.2015. Circular: Regarding the Inter-district transfer on marriage grounds dated 23.10.2015. Transfer/postings of I/C ZEOs and equivalents vide Order No. 550-Edu of dated 21.10.2015. Transfer/Posting of I/C Principals and equivalent vide Order No. 548-Edu of 2015 dated 21.10.2015. Complaint against Mohammad Ayoub Shah, HOD DIET Kulgam for procuring PG Degree Zoology during active service and thereby managing promotion fraudulently vide Order No. 545-Edu of 2015 dated 20.10.2015. Providing of feedback to the Government advocates- filing of objections thereof dated 20.10.2015. MP No. 2/2015, SWP No. 577/2015 MP No. 684/2015 titled Ajay Kumar Sharma and others c/w, MP No. 2/2015, SWP No. 671/2015, MP No. 1/2015,803/2015 titled Kulbir Singh and others V/s State and others vide Order No. 542-Edu of 2015 dated 20.10.2015. Placement of Headmasters and equivalent as I/C ZEO and equivalent vide Order No. 541-Edu of 2015 dated 20.10.2015. Transfers and postings of I/C ZEOs and equivalents vide Order no. 540-Edu of 2015 dated 20.10.2015. SWP No 494/2012 , SWP No. 55/2014 titled Mohd Rafiq V/s State and others vide Order 538-Edu of 2015 dated 20.10.2015. Placement/elevation of Smt Anjana Kumari as I/c Lecturer in the discipline of Music vide Order No. 534-Edu of 2015 dated 19.10.2015. Withdrawal of Placement/elevation of Smt Asha Trisal as I/C Lecturer in the discipline of Music vide Order No. 533-Edu of 2015 19.10.2015. Fixation of seniority in respect of Smt Anjana Kumari, Master in the updated seniority list of PG Masters/Teachers in the discipline of Musice vide Addendum to Government Order No. 400-Edu of 2013 dated 30.3.2013. Acceptance of the resignation of Mr Shadab Arshad Mir, Lecturer (Persian) vide Order No. 530-Edu of 2015 dated 16.10.2015. SWP NO. 2987/2014, CMP No: 4007/2014 titled Tariq Parvez mattoo V/s State and others vide Order No. 529-Edu of 2015 dated 16.10.2015. Compassionate appointment case of Mtr Naseem Akhter W/o Late Mohd Shokat (Ex-ReT Teacher) R/o Village Jandrolla, Tehsil Mandi, District Poonch under SRO-43 of 1994 vide Order No. 528-Edu of 2015 dated 16-10-2015. Compassionate appointment case of Mr Shoyaub Mohd S/o Late Shokat Ali (Ex-Teacher) R/o Basantgarh, Tehsil Ramnagar, District Udhampur under SRO-43 of 1994 vide Order No. 526-Edu of 2015 dated 16-10-2015. Regularization of Adhoc/Contractual/Consolidated Employees working in the School Education Department vide Order No. 525-Edu of 2015 dated 16.10.2015. Inter-district transfer of Mtr Abroo Akber, Teacher, DIET Bandipora, from District Bandipora to District Anantnag on grounds of marriage vide Order No. 524-Edu of 2015 dated 16.10.2015. Initiation of Regular departmental Action against Sh Babu Ram, then Senior Assistant, ZEO office Doongi, Rajouri vide Order No. 523-Edu of 2015 dated 16.10.2015. Regularization of Adhoc/Contractual/Consolidated Employees working in the School Education Department vide Order No. 522-Edu of 2015 dated 15.10.2015. Cancellation of transfer of lecturers posted in the district of Leh/Kargil vide Order No. 521-Edu of 2015 dated 15.10.2015. Notice:- Extension in last date for submission of form by Pvt Educational Institutions requested vide Notice No. FSC/2015/019 dated dated 14.09.2015 and No. FSC/2015/020 dated 14.09.2015. Verification of qualification of the PG Masters/Teachers in the discipline of Chemistry. Complaint against Sh Dalbir Singh Jamwal I/C Lecturer, Chemistry-Appointment of Inquiry Officer thereof vide Order No. 517-Edu of 2015 dated 12.10.2015. Regularization of Adhoc/Contractual/Consolidated Employees working in the School Education Department vide Order No. 516-Edu of 2015 dated 12.10.2015. Transfers and postings of Lecturers vide Order No. 514-Edu of 2015 dated 10.10.2015. Regularization of Adhoc/Contractual/Consolidated Employees working in the School Education Department vide Order No. 513-Edu of 2015 dated 9.10.2015. Regularization of Adhoc/Contractual/Consolidated Employees working in the School Education Department vide Order No. 512-Edu of 2015 dated 9.10.2015. Cancellation of transfers of Lecturers posted in the districts of Leh/Kargil vide Order No. 511-Edu of 2015 dated 9.10.2015. Regularization of Adhoc/Contractual/Consolidated Employees working in the School Education Department vide Order No. 510-Edu of 2015 dated 8.10.2015. Contempt No. 294/2014 titled Om Prakash and others in SWP No. 1172/2013 titled Shabir Ahmed and others V/s State and others vide Order No. 509-Edu of 2015 dated 7.10.2015. SWP No 2214/2014 CMA No. 2969/2014 titled Arshad Ali and others V/s State and others vide Order No. 508-Edu of 2015 dated 7.10.2015. SWP No 3318/2014 CMA No. 4461/2014 titled Nazakat Ali and others V/s State and others vide Order No. 507-Edu of 2015 dated 7.10.2015. SWP No 350/2015 CMA No. 417/2015 titled Virender Kumar and others V/s State and others vide Order No. 506-Edu of 2015 dated 7.10.2015. SWP No 1386/2015 titled Shanker Dass and others V/s State and others vide Order No. 505-Edu of 2015 dated 7.10.2015. SWP No 824/2012 titled Mohd Rafiq and others V/s State and others vide Order No. 504-Edu of 2015 dated 7.10.2015. Compassionate appointment case of Mr Mukesh Dutt S/o Late Dev Dutt (Ex-Peon) R/o Bahu Fort, Jammu under SRO-43 of 1994 vide Order No. 503-Edu of 2015 dated 07-10-2015. Nomination of Ist Appellate Authority under J&K RTI Act 2009 in respect of School Education Department vide Order No 498-Edu of 2015 dated 5.10.2015. Appointment of Inquiry Officer vide Order No. 490-Edu of 2015 dated 03.10.2015. Notice:- Permission to collect fee from the students for the month of September and October 2014 dated 01.10.2015. Transfer of School Buildings of Primary School Jassore, Primary School Sabha Basti Badyal Brahamana Upper and Primary School Dherian Badyal Brahamana Upper by Deputy Commissioner, Jammu vide Order No. 487-Edu of 2015 dated 30.09.2015. Administrative Approval for Establishment of Computer Aided Learning Centres under SSA vide Order No. 474-Edu of 2015 dated 22-09-2015. Placement of PG MastersTeachers as I/C Lecturers in the discipline of Environmental Science vide Order No. 470-Edu of 2015 dated 18.9.2015. Assignment of charge of SPD, SSA vide Order No. 466-Edu of 2015 dated 17-09-2015. Compassionate appointment case of Mtr Shahmal Begum W/o Late Fayaz Ahmed (Ex- Teacher) R/o Gool Tehsil &, District Ramban under SRO-43 of 1994 vide Order No. 465-Edu of 2015 dated 15-09-2015. Compassionate appointment case of Mr Manzoor Ahmad S/o Late Mohammad Shafi (Ex-Senior Teacher) R/o Juddah Dhansal, Tehsil Mahore, District Reasi under SRO-43 of 1994 vide Order No. 462-Edu of 2015 dated 15-09-2015. Notice for Private Educational Institutions issued by Committee for fixation of fee structure of Private Educational Institutions vide dated 14-09-2015. Transfers/Postings of I/C Principals and equivalents vide Order No. 452-Edu of 2015 dated 12-09-2015. Transfers/Postings of I/C Principals and equivalents vide Order No. 451-Edu of 2015 dated 12-09-2015. Administrative Approval for Establishment of Smart Classroom with Computer Labs under ICT in Schools Scheme of RMSA during the year 2015-16 vide Order No. 449-Edu of 2015 dated 10-09-2015. Compassionate appointment case of Smt Laxmi Rani W/o Late Ashok Kumar (Ex-Teacher) R/o Village Karlah, Tehsil Chenani Distt Udhampur under SRO-43 of 1994 vide Order No. 447-Edu of 2015 dated 09-09-2015. Notice-Tentative Seniority List of PG Masters/Teachers in the discipline of Maths. Notice-Tentative Seniority List of PG Masters/Teachers in the discipline of History. Notice-Tentative Seniority List of PG Masters/Teachers in the discipline of English. Placement of P G Masters/teachers as Lecturer in the discipline of Environmental Science vide Order No. 438-Edu of 2015 dated 27-08-2015. Corrigendum to Government Order No. 381-Edu of 2015 dated 03-08-2015. Final Seniority list of P. G. Masters/Teachers in the discipline of Environmental Science vide order No. 435-Edu of 2015 dated 25-08-2015. Transfers/Postings of I/C Principals and equivalents vide Order No. 431-Edu of 2015 dated 24-08-2015. Transfers/Postings of I/C Chief Education Officers and equivalents vide Order No. 423-Edu of 2015 dated 22-08-2015. Notice: Placement of Headmasters and equivalents as I/C ZEOs. Notice; Placement of Senior Lecturers/ZEOs as I/c Principals. Transfer/Postings vide Order No. 416-Edu of 2015 dated 19-08-2015. SWP No 1561/2015 MP No. 1/2015 titled Abdul hamid V/S State and others vide Order No. 414-Edu of 2015 dated 19-08-2015. Transfer/Posting of Principal vide Order no. 413- Edu of 2015 dated 18-08-2015. Deputation of Shri Farooq Ahmad Peer I/c Principal, Higher Education Department to School Education Department for posting as Joint Secretary, J&K Board of School Education vide Order No 411-Edu of 2015 dated 18-08-2015. Notice-Tentative Seniority List of PG Masters/Teachers in the discipline of Sanskrit. Notice-Tentative Seniority List of PG Masters/Teachers in the discipline of Geography. Transfer/Posting of Sh Naseer Ali Malik I/c Principal vide order No. 399-Edu of 2015 dated 11-08-2015. Collection of data of degrees/certificates of ReTs/RReTs obtained through study certre/distance mode vide Order No. 396-Edu of 2015 dated 8.8.2015. Constitution of committee for implementation of judgment passed by the Hon'ble High Court in the case SWP No. 346/2014 titled Faisal Ahmad Khan V/s State and others vide Order No. 353-Edu of 2015 dated 23-07-2015. Judgment of Hon'ble High Court of Jammu and Kashmir regarding ReTs and Record note of the meeting held on 8.7.2015 regarding implementation of Hon'ble High Court order dated 14.5.2015 in the case titled "Faisal Ahmed Khan V/s State and others". Designation of competent authority under clause 2(a) of Govt. Order No. 435-Edu of 2010 dated 30.04.2010 vide Order No. 389-Edu of 2015 dated 05-08-2015. Addendum to Meeting notice dated 01.08.2015 regarding recognition of ETT Institutes/Pvt. Schools. Placement of Senior Lecturers and ZEOs/equivalents as I/c Principals and equivalents: posting thereof vide order No. 382-Edu of 2015 dated 03-08-2015. Transfer/postings of I/c principals and equivalents vide order No. 381-Edu of 2015 dated 03-08-2015. Transfer/postings of I/c principals and equivalents vide order No. 380-Edu of 2015 dated 03-08-2015. Transfer/Posting of Lecturer vide Order No 374-Edu of 2015 dated 31-07-2015. Transfer/Posting of I/c Principals and equivalents vide Order No. 371-Edu of 2015 dated 29-07-2015. Transfer and postings of I/c Chief Education Officers and equivalents vide Order No. 370-Edu of 2015 dated 29-07-2015. Appointment of Chairman of the Committee for fixation of fee structure: terms and conditions thereof vide Order No. 369-Edu of 2015 dated 28-07-2015. Transfers and postings vide order No. 368-Edu of 2015 dated 28-07-2015. Transfer of Lecturer from Kargil vide Government Order No. 367-Edu of 2015 dated 28-07-2015. Nomination of Representation of Jammu & Kashmir State Board of School Education and of a Chartered Accountant in the Committee for fixation of fee structures of Private Educational Institutions in the State. Cancellation of transfer of Lecturer posted in the districts of Leh and Kargil vide Order No. 362-Edu of 2015 dated 28-07-2015. Cancellation of transfer of Lecturer posted in the districts of Leh and Kargil vide Order No. 361-Edu of 2015 dated 28-07-2015. Cancellation of transfer of Lecturer posted in the districts of Leh and Kargil vide Order No. 360-Edu of 2015 dated 28-07-2015. 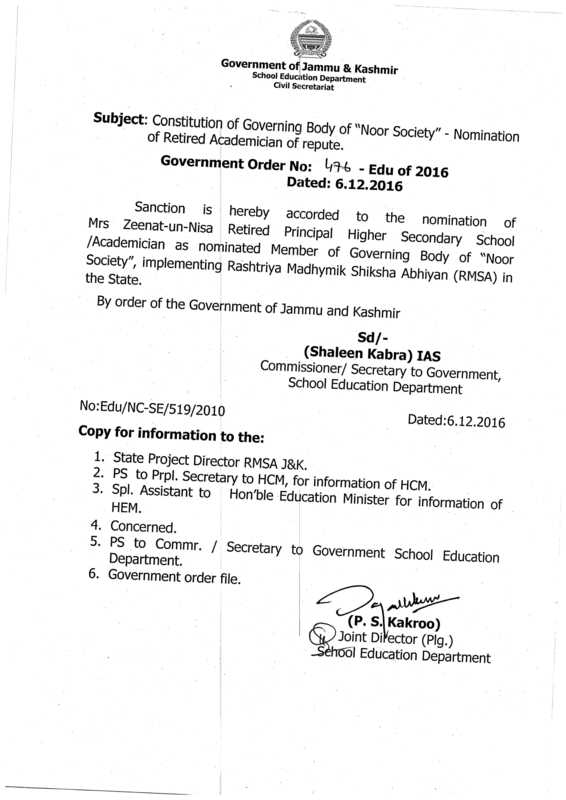 Appointment of Chairman of the Jammu and Kashmir Board of School Education. Implementation of Transfer orders vide Order No. 327-Edu of 2015 dated 10-07-2015. Meeting Notice- SWP No. 346/2014 titled Faisal Ahmad Khan v/s State and others. Notice-Tentative Seniority List of PG Masters/Teachers in the discipline of Political Science as on 01-06-2015. Notice-Tentative Seniority List of PG Masters/Teachers in the discipline of Economics as on 01-06-2015. Transfers/Postings of I/C Principals and equivalent vide 293-Edu of 2015 dated 23-06-2015. Notice-Tentative Seniority List of PG Masters/Teachers in the discipline of Sociology as on 01-06-2015. Cancellation of transfer of Lecturer posted in the districts of Leh and Kargil vide Order No. 292-Edu of 2015 dated 19-06-2015. Cancellation of transfer of Lecturer posted in the districts of Leh and Kargil vide Order No. 291-Edu of 2015 dated 19-06-2015. Nomination of Public Information Officers (PIOs) under J&K Right to Information Act 2009 in respect of School Education Department vide 286-Edu of 2015 dated 18-06-2015. 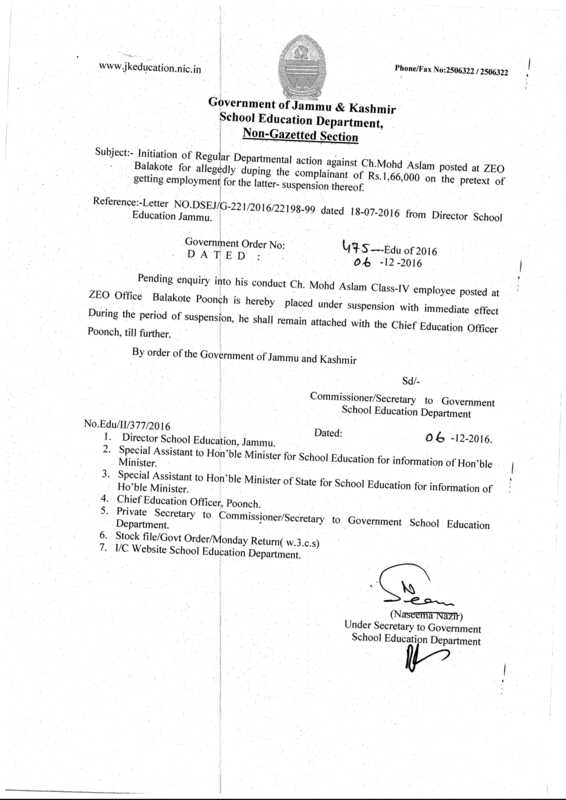 Deputation of Shri Rayees Ahmad Dar, Lecturer (Statistics), DIET Sopore vide order No.279-Edu of 2015 dated 15-06-2015. Regularization of Adhoc/Contractual/Consolidated employees working in the School Education Department vide Order No. 276-Edu of 2015 dated 15-06-2015. Cancellation of transfers of Lecturers posted in the districts of Leh and Kargil vide Order No. 275-Edu of 2015 dated 13-05-2015. Regularization of Adhoc/Contractual/Consolidated employees working in the School Education Department vide Order No. 268-Edu of 2015 dated 10-06-2015. Regularization of Adhoc/Contractual/Consolidated employees working in the School Education Department vide Order No. 264-Edu of 2015 dated 08-06-2015. Summer vacations in Summer Zone of Jammu Division vide Order No. 262-Edu of 2015 dated 07-06-2015. Cancellation of transfer of Lecturer posted in the districts of Leh and Kargil vide Order No. 248-Edu of 2015 dated 27-05-2015. Cancellation of transfers of Lecturers posted in the districts of Leh and Kargil vide Order No. 247-Edu of 2015 dated 27-05-2015. Transfers and postings of I/c Principals and equivalents vide Order No. 245-Edu of 2015 dated 23.05.2015. Corrigendum to Order No. 133-Edu of 2015 dated 30-03-2015. Transfer and posting of Lecturers vide Order No. 244-Edu of 2015 dated 21-05-2015. Addendum to Government Order No. 243-Edu of 2015 dated 21-05-2015. Transfers/postings of I/c zonal Education Officers & equivalent vide Order No. 243-Edu of 2015 dated 21-05-2015. Cancellation of transfers of Lecturers posted in the districts of Leh and Kargil vide Order No. 231-Edu of 2015 dated 15-05-2015. Cancellation of transfers of Lecturers posted in the districts of Leh and Kargil vide Order No. 230-Edu of 2015 dated 15-05-2015. Cancellation of transfers of Lecturers posted in the districts of Leh and Kargil vide Order No. 229-Edu of 2015 dated 15-05-2015. Cancellation of transfers of Lecturers posted in the districts of Leh and Kargil vide Order No. 228-Edu of 2015 dated 15-05-2015. Cancellation of transfers of Lecturers posted in the districts of Leh and Kargil vide Order No. 227-Edu of 2015 dated 15-05-2015. Updated seniority list of PG Masters/teachers in the discipline of Electronics as on 01-05-2015 vide Order No. 224-Edu of 2015 dated 13-05-2015. Regularization of Adhoc/Contractual/Consolidated employees working in the School Education Department vide Order No. 222-Edu of 2015 dated 12-05-2015. Regularization of Adhoc/Contractual/Consolidated employees working in the School Education Department vide Order No. 220-Edu of 2015 dated 12-05-2015. Registration of cases FIR No. 27/2012 and 28/2012 P/S VOJ against S/Shri Natha Ram Dhingra, I/C CEO, Jammu and Yogeshwar Raj Thusoo, Ex I/C CEO Doda and other Officers of School Education Department vide Order No. 215-Edu of 2015 dated 08-05-2015. Notice- Tentative seniority List as on 01.05.2015 of PG Masters/Teachers in the discipline of Zoology. Notice- Tentative seniority List as on 30.04.2015 of PG Masters/Teachers in the discipline of Stenography. Notice- Tentative seniority List as on 01.05.2015 of PG Masters/Teachers in the discipline of Botany. Attachment of Shri Nazir Ahmed Dar, Ex-CEO Budgam and Shri Nazir Ahmed, Principal, HSS, Magam vide Order No. 206-Edu of 2015 dated 24-04-2015. Setting-aside the recruitment process of Class-IV posts of District Budgam vide Order No 205-Edu of 2015 dated 24-04-2015. Transfers/postings of Lecturers vide Order No. 202-Edu of 2015 dated 24-04-2014. Transfers/postings of Zonal Education Officers and equivalents vide Order No. 199-Edu of 2015 dated 24-04-2015. Transfer/postings of I/c Chief Education Officers & equivalent vide Order No. 192-Edu of 2015 dated 24-04-2015. Compassionate appointment case of Mst Saira Begum W/o Late Aftab Ahmad Mir (Ex-) R/o Village Nagar, Tehsil Bhaderwah, District Doda under SRO-43 of 1994 vide Order No. 179-Edu of 2015 dated 22-04-2015. Compassionate appointment case of Mr Zaffar Iqbal S/o Late Nazir Hussain (Ex-Teacher) R/o Mohra, Tehsil Mendhar, District Poonch, under SRO-43 of 1994 vide Order No. 178-Edu of 2015 dated 22-04-2015. Transfers/postings of I/c Principals & equivalent vide Government Order No 176-Edu of 2015 dated 22-04-2015. Compassionate appointment case of Mr Bharti Sambyal. S/o Late Karunavati (Ex-Library Assistant) R/o W. No. 13, Shastri Nagar, Kathua, under SRO-43 of 1994 vide Order No 173-Edu of 2015 dated 22-04-2015. Regularization of I/c Lecturers as Lecturers in the discipline of English, corrigendum to Government No. 112-Edu of 2015 dated 22-03-2015. Notice- Change of Nomenclature as "KNIT Green Model Academy, Gajay Singh Pura, Jammu" instead of "Green Model Avademy, Gajay Singh Pura, Jammu". Transfers/postings of Lecturers from/ to the districts of Leh and Kargil vide order No. 169-Edu of 2015 dated 16-04-2015. Transfers/ postings of I/c Principals and Equivalent vide Order of 156-Edu of 2015 dated 09-04-2015. Transfers/postings of Zonal Education Officers & equivalent vide 154-Edu of 2015 dated 08-04-2015. Transfers/postings of Lecturers vide Order No. 153-Edu of 2015 dated 08-04-2015. Compassionate appointment case of Mr Mudasir ahmad Malik S/o Late Gh. Mohi-ud-din Malik (Ex-Chowkidar) R/o Nehalpora, Tehsil Pattan, District Baramulla under SRO-43 of 1994 vide Order No. 152-Edu of 2015 dated 08-04-2015. Notice: Tentative Seniority list of PG Masters/Teachers in the discipline of Commerce, 2015. Compassionate appointment case of Ms Muneera Jan D/o Late Ghulam Mohammad Mir (Ex-Teacher) R/o Chakura, Tehsil and District Pulwama under SRO-43 of 1994 vide Order No. 149-Edu of 2015 dated 06-04-2015. Transfers and Postings of Chief Education Officers and equivalent vide Order No. 145-Edu of 2015 dated 04-04-2015. Compassionate appointment case of Mr Javid Ahmad S/o Late Ab. Rashid (Ex-Chowkidar) R/o Shibrass, Tehsil Mahore, District Reasi, under SRO-43 of 1994 vide Order No. 141-Edu of 2015 dated 31-03-2015. Compassionate appointment case of Smt Sunita Devi W/oMr. Ravi Kumar S/o Late Mr Waryam Singh (Ex-Peon) R/o Raipur Satwari, Tehsil & District Jammu under SRO-43 of 1994 vide Order No. 140-Edu of 2015 dated 31-03-2015. Compassionate appointment case of Smt Saroj Bala W/o Late Mr Naveen Kumar (Ex-Lab. Bearer) R/o Badyar Brahmna, Tehsil R. S. Pura, district Jammu, under SRO-43 of 1994 vide Order No. 139-Edu of 2015 dated 31-03-2015. Compassionate appointment case of Smt Sunita Devi W/o Late Mr Rohit Sharma (Ex-Teacher) R/o Village Neota, Tehsil Bhaderwah, District Doda under SRO-43 of 1994 vide Order No. 138-Edu of 2015 dated 31-03-2015. Grant of extraordinary leave in favour of Smt Rohini Sharma, Lecturer Hindi, HSS Kandoli Nagrota, Jammu vide Order No. 133-Edu of 2015 dated 30-03-2015. Release of additionality as matching State Share (Capital Component) under National Programme for MDM in schools during 2014-15 vide Order No. 132_Edu of 2015 dated 30-03-2015. Revalidation of funds for the year 2013-14 under National Programme MDM in Schools-release thereof vide Order No.131-Edu of 2015 dated 29-03-2015. Transfers and postings vide Order No. 130-Edu of 2015 dated 28-03-2015. NOTICE- Tentative seniority list of PG Masters/Teachers in the discipline of Environmental Science. Sanction of Advance Drawal of funds for Educational Tour 2014-15 vide Order No. 129-Edu of 2015 dated 27-03-2015. Grant of Extra-Ordinary leave in favour of Smt Deepmala, Lecturer (Hindi), HSS Smailpur vide Order No. 125-Edu of 2015 dated 24-03-2015. Transfer/ Postings of Lecturers from/ to Leh and Kargil Districts vide Order No. 109-Edu of 2015 dated 21-03-2015. Regularization of I/c Lecturers as Lecturers the discipline of Economics. Order No. 115-Edu of 2015 dated 22-03-2015. Regularization of I/c Lecturers as Lecturers the discipline of Political Science. Order No. 114-edu of 2015 dated 22-03-2015. Regularization of I/c Lecturers as Lecturers the discipline of Botany. Order No. 113-Edu of 2015 dated 22-03-2015. Regularization of I/c Lecturers as Lecturers the discipline of English. Order No. 112-edu of 2015 dated 22-03-2015. Transfers of Principals and equivalent. Updated Seniority list of Senior Lecturers of School Education Department as it Stood on 1st February,2013. Government Order No: 220-Edu of 2013 dated: 12-03-2017. Notification for Building up a separate, specialist cadre of Teacher Educators. Review of Teacher cadre Structure and recruitment norms for public comments. Winter Vacation in Kashmir Valley / Winter Zones of Jammu Division. Order NO:- 683-Edu of 2012 Regularization of I/C Lecturers as lecturers in the discipline of Statics. Order NO:- 682-Edu of 2012 Regularization of I/C Lecturers as lecturers in the discipline of Punjabi. Order NO:- 680-Edu of 2012 Regularization of I/C Lecturers as lecturers in the discipline of Home Science. Order NO:- 679-Edu of 2012 Regularization of I/C Lecturers as lecturers in the discipline of Arabic. Order NO:- 606-Edu of 2012 Placement of I/C Headmasters and equivalent as I/C Zonal Education officers and equivalent. Transfers and Postings thereof. Order NO:- 495-Edu of 2012 Placement of principal as I/C Chief Education Officer and equivalent. Transfers / postings thereof. Order NO:- 492-Edu of 2012 Placement of principal and equivalent as I/C Chief Education Officer and equivalent. Transfers / postings thereof. Combined revised tentative list of I/C Headmasters and equivalent of school Education Department for their regularization as Headmasters and equivalent. Order No:- 377- Edu of 2012 Dated:- 17-04-2012. Titled:-Placement of Senior Lecturers/ZEO as I/C Principals and equivalent - transfer and posting thereof. 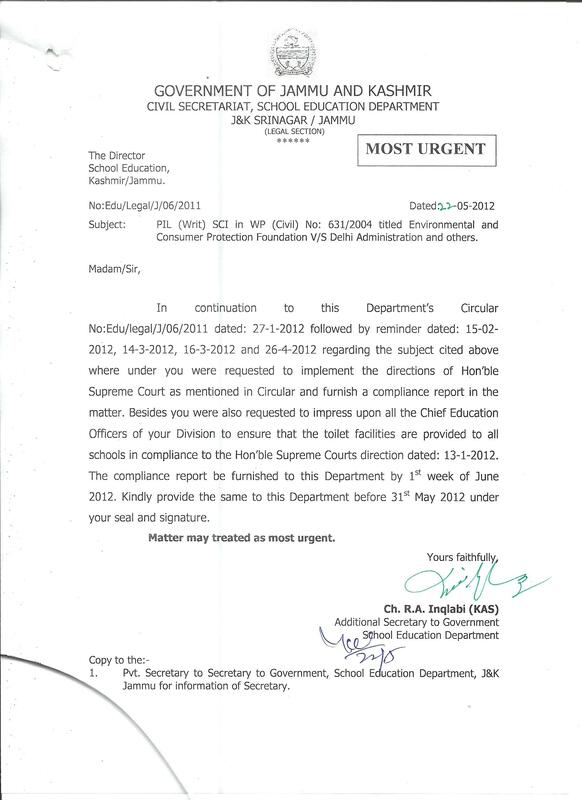 Order No:- 345- Edu of 2012 Dated:- 03-04-2012. Titled:-Placement of Principals & equivalent as I/C Chief Education Officers & equivalent- transfers and postings thereof. Order No:- 335- Edu of 2012 Dated:- 30-03-2012. Titled:-Stepping up of pay in favour of Smt. Veena Kumari, master GGHS Domana at par with her Junior counterpart namely Smt. Uma Rani, Master GGHS Domana. Order No:- 334- Edu of 2012 Dated:- 30-03-2012. Titled:- Stepping up of pay in favour of Sh. Abdul Rauf Ex-Incharge, Chief Education Officer, Leh. Order No:- 324- Edu of 2012 Dated:- 29-03-2012. Titled:- Transfer of Smt. Madhu Khajuria, Master, Govt. Higher Secondary School, Tikri, Udhampur on medical grounds. Order No:- 316- Edu of 2012 Dated:- 27-03-2012. Titled:- Compassionate appointment of Smt. Asha Kumari, Wd/o. Late Shri Kundan Lal (Ex- Sr. Assistant, Z.E.O, Sunderbani)R/o. Thanda Pani, Tehsil- Sunderbani, District- Rajouri under SRO-43 of 1994. Order No:- 312- Edu of 2012 Dated:- 27-03-2012. Titled:- Centrally sponsored Scheme of Teacher Education. Order No:- 308- Edu of 2012 Dated:- 27-03-2012. Titled:- Release of funds under Annual Plan 2011-12. Order No:- 300- Edu of 2012 Dated:- 22-03-2012. Titled:- Placement of I/C Z.E.O's & equivalent as I/C Joint Directors & equivalent and Principals & equivalent as I/C C.E.Os & equivalent- transfers and postings thereof. Compassionate appointment of Smt. Vijay Laxmi(Ex- Peon, GMS Zone Akhnoor, District- Jammu), R/O. Akhnoor District- Jammu under SRO-43/1994. Transfer/ Posting of I/C Chief Education Officers & equivalent. Improvement of Qualification by Ev's. Sanction pf deputation of Mtr. 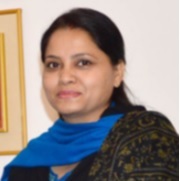 Shagufta Parveen, Director, School Education Kashmir to New Delhi. Order Date:- 01-03-2012; Titled as:- Zero percent result of Class-X Board Examination during the Annual Session, Nov-2011. Placement of Senior Lecturers and I/C Z.E.O's & Equivalent as I/C Principals & equivalent - transfer/posting/adjustment thereof. Post facto sanction for having taken medical treatment at AIMS, New Delhi by Mtr. Rifat Rohee. Release of Additional Funds in favour of Principal, Sainik School, Manasbal for the year 2011-12.